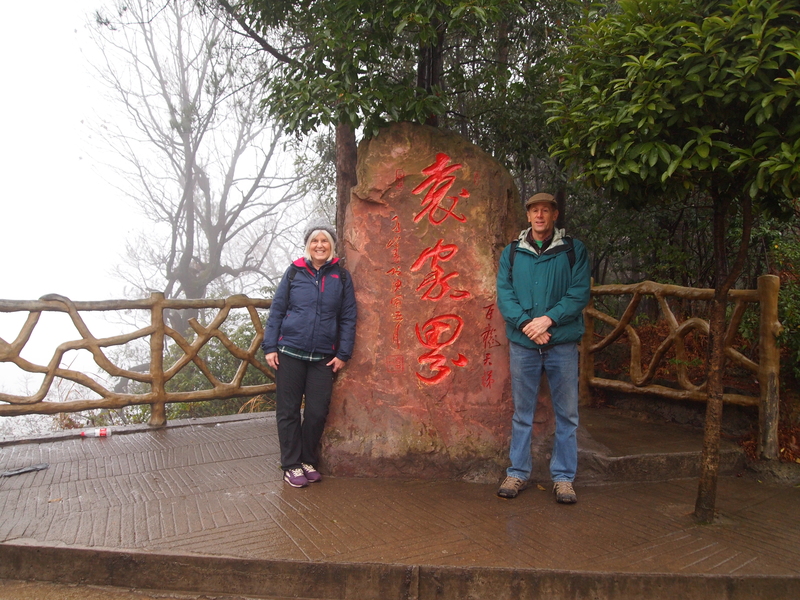 In late January, my husband Mike traveled from Virginia to visit me here in China. 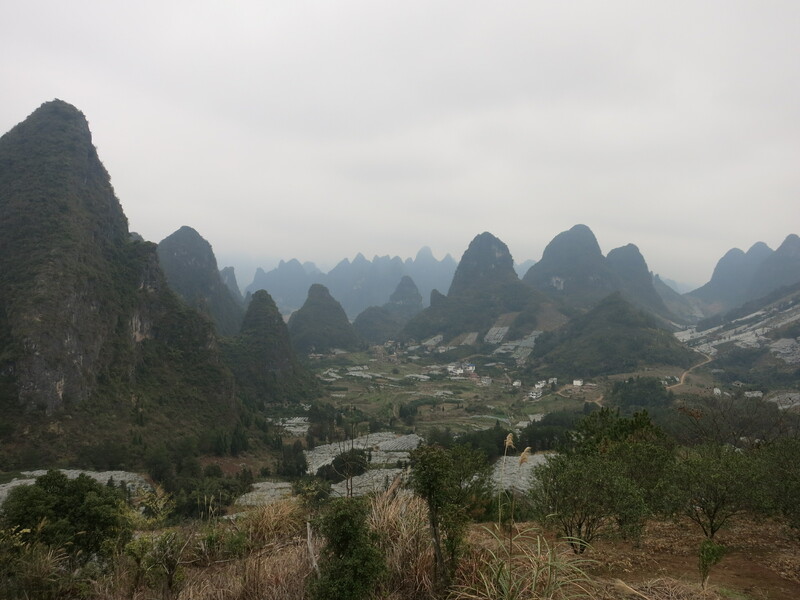 We went to Hunan province, where we visited Fenghuang and Zhangjiajie, and to Guangxi, where we visited Guilin and Yangshuo. I was disappointed for him because we had horrible weather for nearly the whole time he was here. 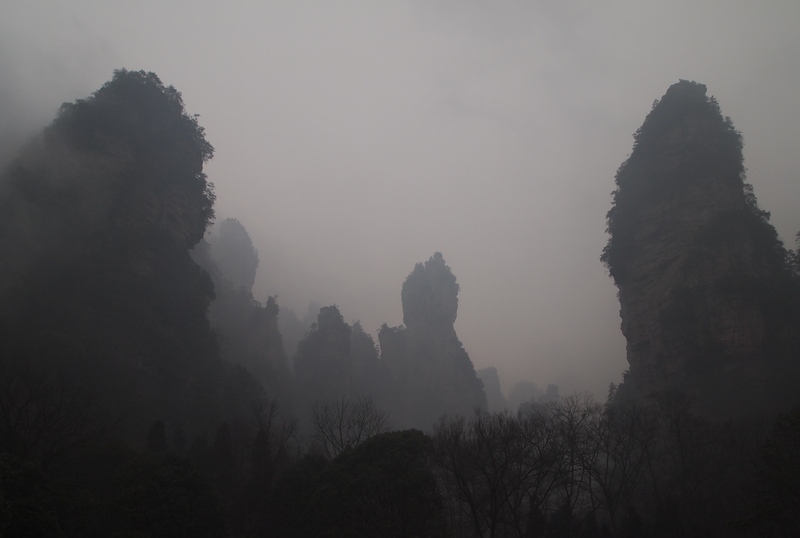 His one and only experience of China was a rainy, fog-enshrouded, cold and gloomy one. In his reflections below, you can see that despite our hardships, he managed to see the experience as a positive one. 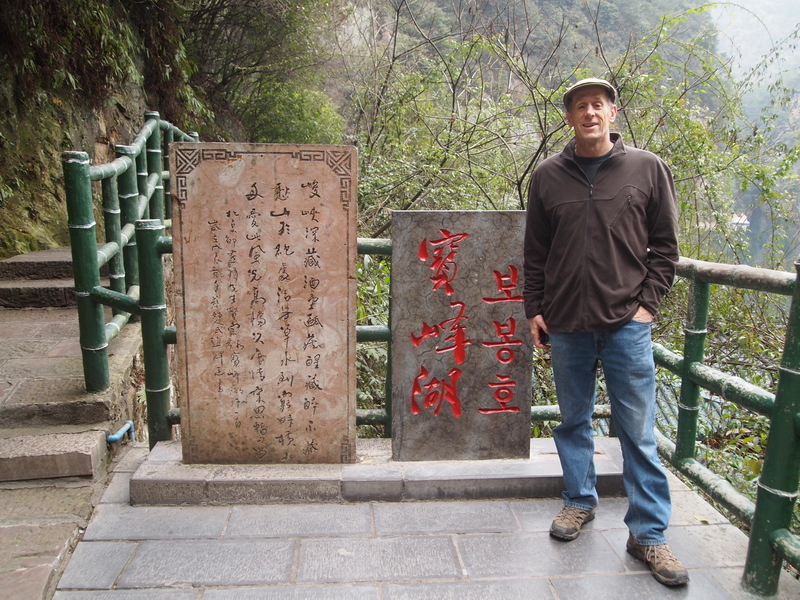 This was more than I could say for myself, but then I’ve seen better days in China. Here are Mike’s reflections, along with some of the photos he took. 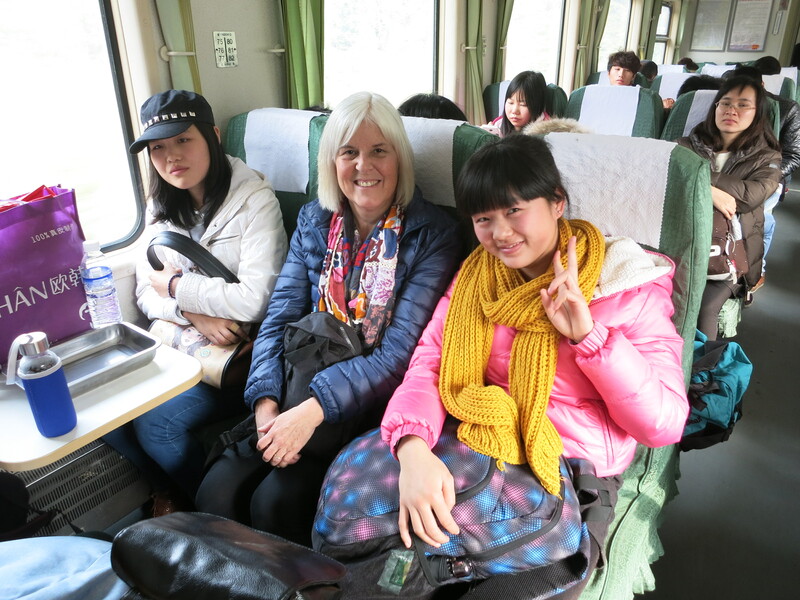 After Cathy decided to go to China to teach this year she suggested that I should plan on visiting and traveling with her on one of her breaks. My initial reaction was less than enthusiastic. My first inclination is to plan relaxing, stress-free, outdoorsy vacations away from crowds and the fast-paced life I deal with in the DC suburbs. After giving the idea some thought and talking more with Cathy, I committed, leaving the planning to her, providing feedback on trip options when asked. I am an avid reader, like Cathy, and have an interest in cultural anthropology and world history, which I get from a fictional and non-fictional perspective. In addition to having the opportunity to spend some time with my nomad wife, I would see firsthand how one in five people on our planet live. I knew from the outset that this trip would be a challenge, starting and ending with the long time-zone crossing flights halfway around the globe. 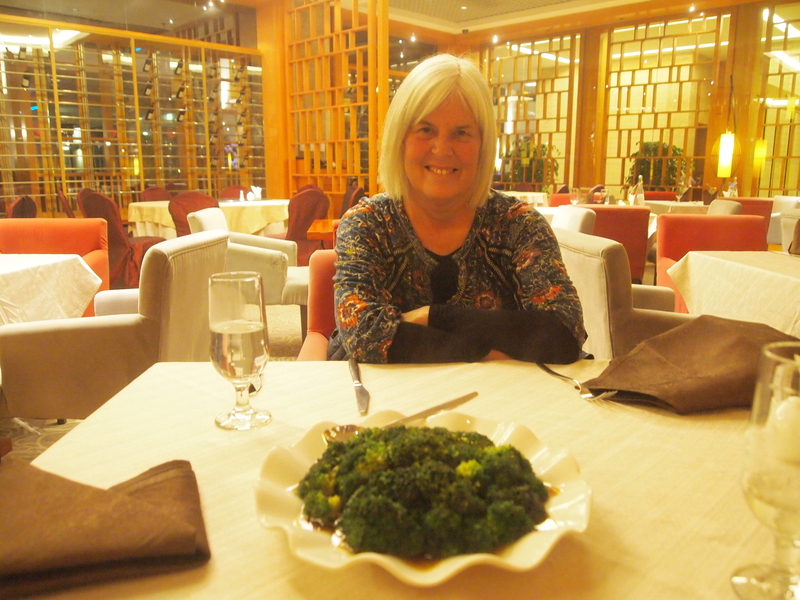 From Cathy’s early travel experiences in China I knew that our in-country travels would not be easy. Neither of us are much on tour groups, preferring the freedom to move about at our own pace, surrounded by local folks, being forced to figure things out on our own. That‘s half the adventure. The apprehension we felt every time we ventured out to our next destination was rewarded with a sense of accomplishment and relief upon arrival. 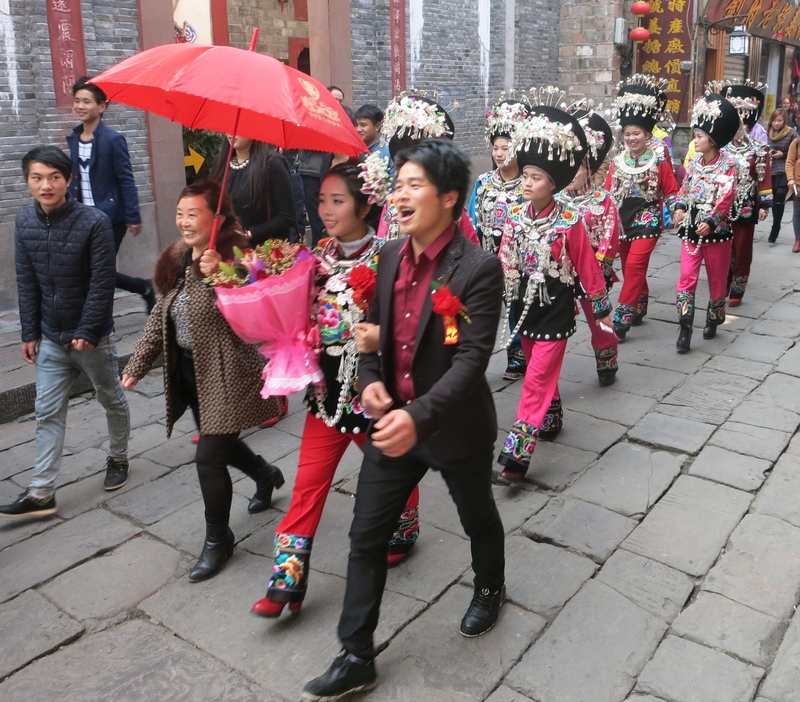 I came with no expectations other than to relish the uniqueness of China. 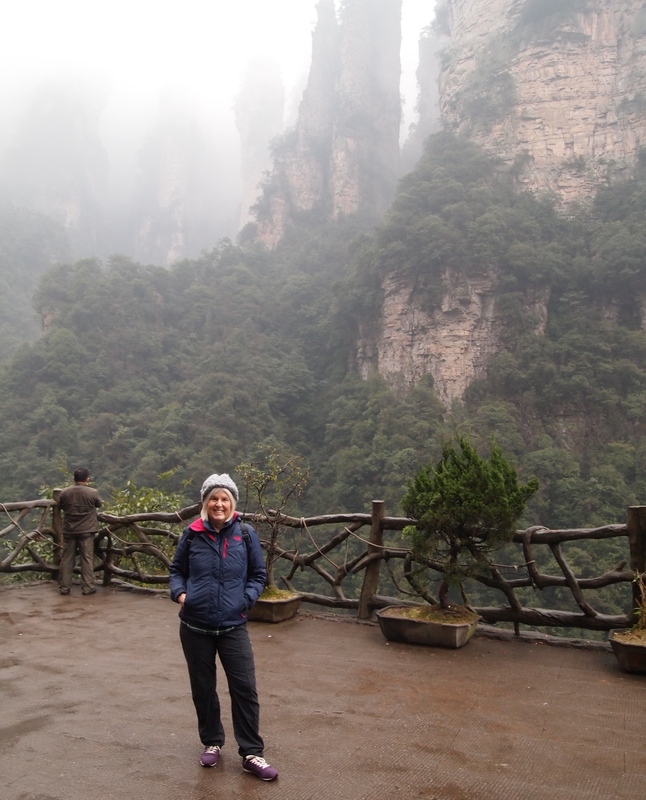 Cathy put a lot of time and energy into our itinerary, hoping to show me the picturesque and historic side of Guangxi and Hunan provinces. You seasoned travelers understand the tenuous balance between trying to visit as many places as possible within a tight time window and allowing oneself the time to soak in the essence of each layover, and recharge, before diving in to the next adventure. I felt like we achieved that balance. 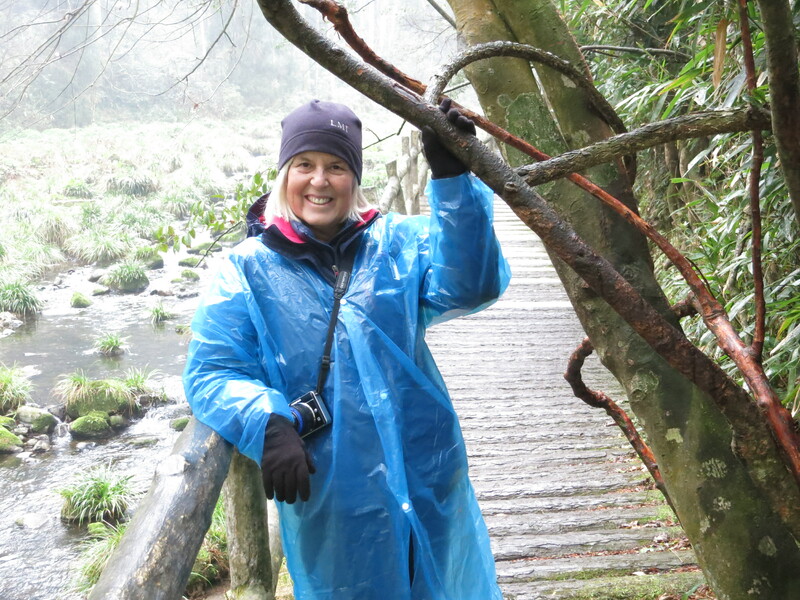 Cathy was very honest on her blog in describing her disappointment with the cool damp weather during my visit. 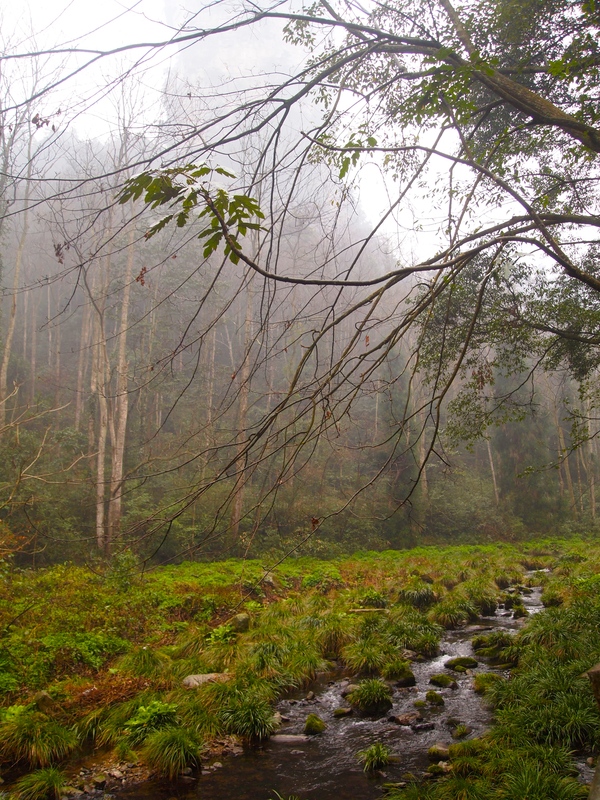 Besides yielding a series of fog shrouded photos for her blog, she was sad for me. I am sure that many travel bloggers portray only the positive aspects of their trips, which is not reality. You have to accept and learn to deal with weather and other circumstances that don’t go your way. I like how Cathy freely shares her personal frustrations in her blogs. Yes, I would have enjoyed some clear sunny days, but I was so alert to the sights, sounds, smells and the way of life wherever we went that the weather had much less of an impact on me than Cathy. 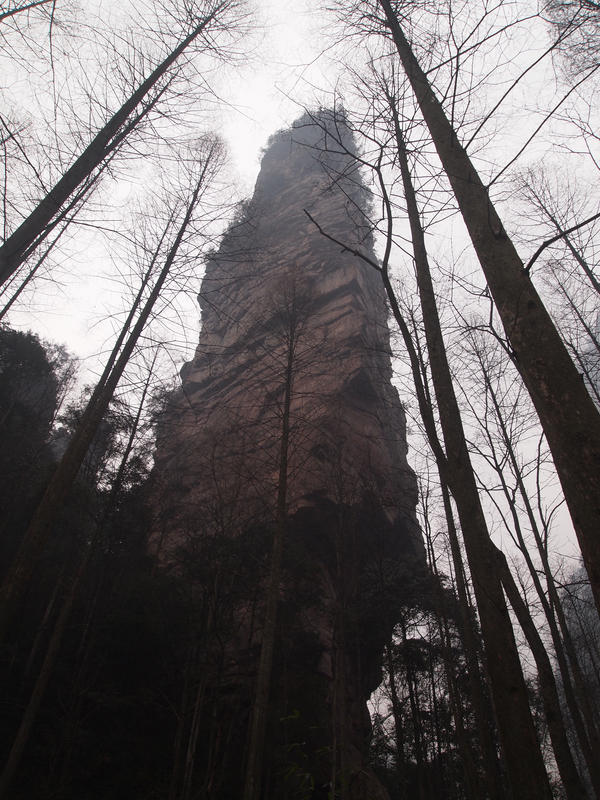 The mist encased quartz-sandstone pillars of Zhangjiajie and the limestone karsts of Yangshuo looked whimsical and mysterious. The one rainy day where we didn’t go trekking was spent lounging in bed reading and treating ourselves to a muscle relaxing massage. That was just what we needed, some down time to recover. I was constantly fascinated by assorted modes of transportation, the unified flow of scooters, bikes and buses on the crowded streets and dusty rural roads, the lack of heat throughout, the family way of life in the shops, service bays, and eateries, the variety of critters and body parts offered on the menus, the placid acceptance of a quality of life that few westerners could imagine, the third world toilets, the often derelict trains and train stations, the rural communal hamlets we cycled through, the villagers laboring in the never-ending fields, and the general friendliness of the people we encountered. 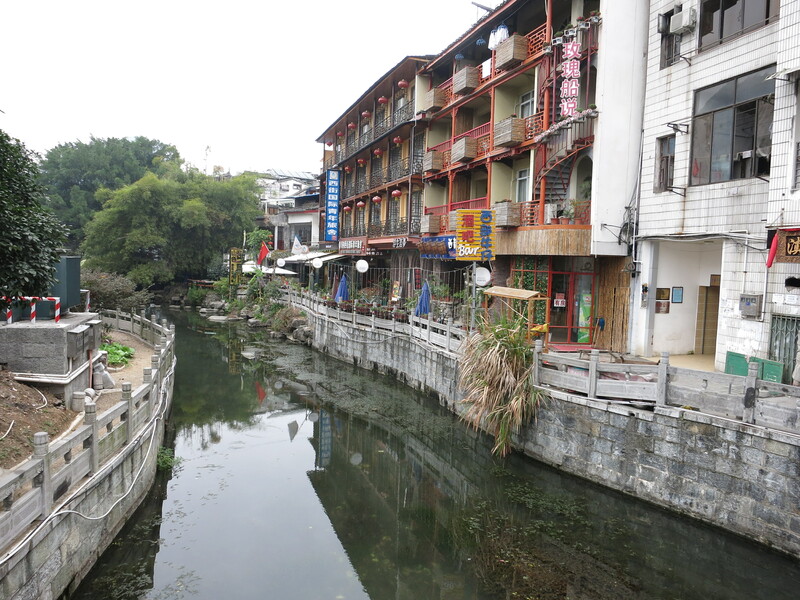 I wanted to see where Cathy lived, where she worked, the students she taught, where she shopped and ate, how she traveled, the soul and spirit of the bustling cities, the steady march of the rural farms, so I could get a sense for the environment she moved about in during her life in Guangxi. 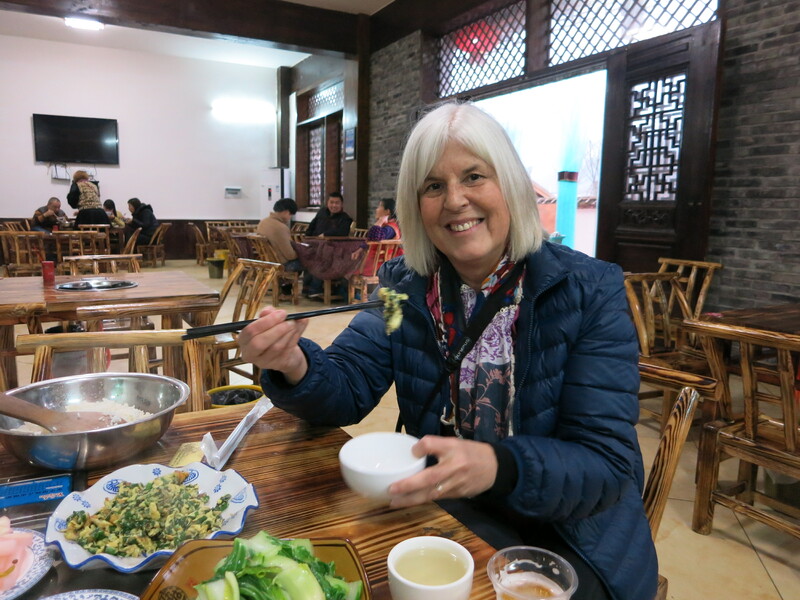 Thankfully those impressions will now be with me for the rest of her stay in Nanning, sensory impressions catalogued and brought to mind as she shares with me her weekly recap on Skype. Instead of her face and the stories she tells in words, I will see much more. 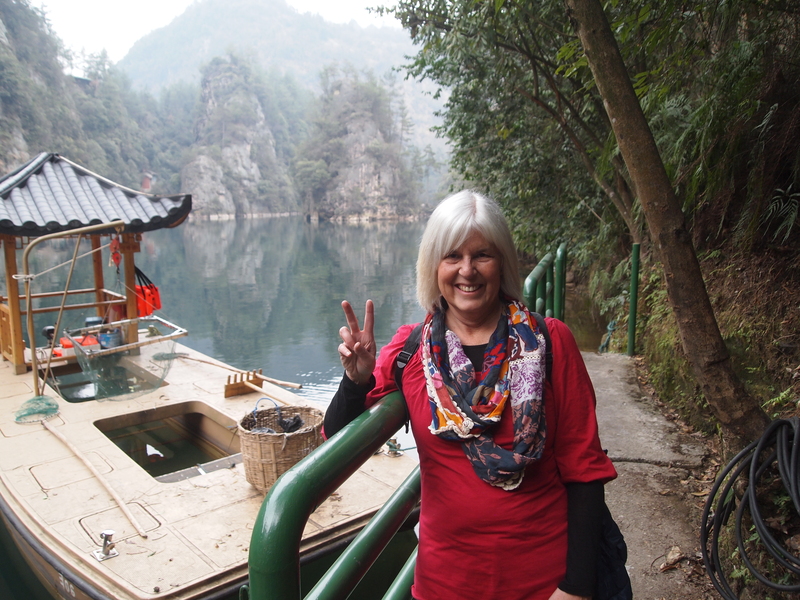 There are so many memories and images that come to mind from our two-week excursion, all fascinating to me, many of which Cathy has already shared in her blog. Some of these memories can’t be captured by pictures and words. They were moments of interaction, on some level, with others, in a land where one feels so isolated, despite being surrounded by 1.3 billion people. The thirteen hour plane ride seated next to a mother and her young son from Mongolia on their return trip from studying at the international school in Miami, Florida, the respectful sharing of a small train compartment for twelve hours with two young strangers, the prideful smile on the face of our dumpling lady in Fenghuang who was thrilled to see us show up for breakfast three mornings in a row, the conversation with a young woman, employed in international sales, on our boat ride on Baofang Lake, the engaging conversation with Duco, the young Dutch backpacker, on our bus ride to Yangshuo, the family we traveled with on our Li river bamboo raft, and the many challenging interactions arising from the language barrier at every twist and turn. 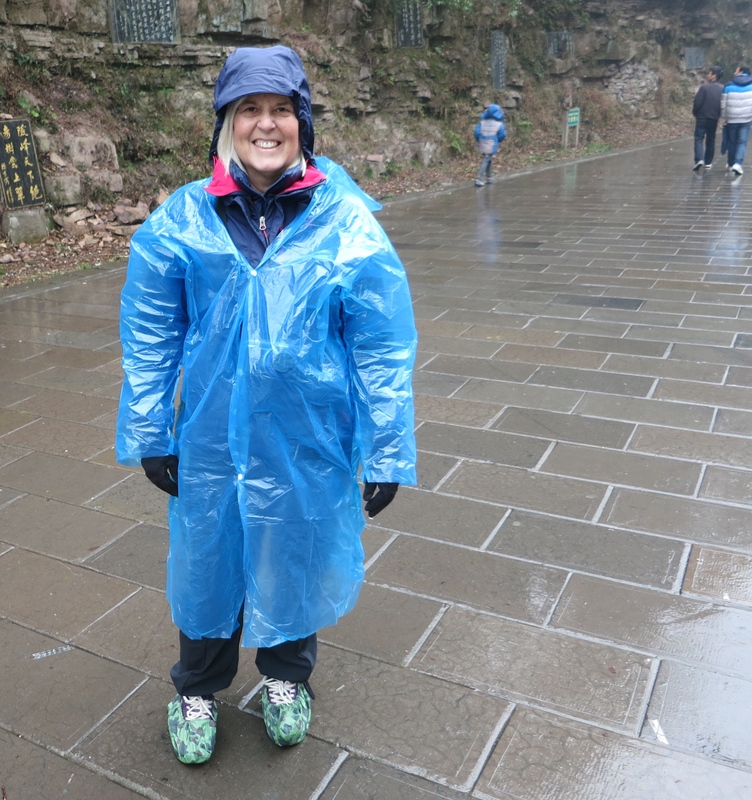 In one of Cathy’s blogs about Alex’s time in China she mentions a tension-filled afternoon. This is to be expected, in less than ideal travel situations and close quarters, as individual expectations collide with circumstances and each other. I suppose the key to traveling with someone else, successfully, is to recognize that this will happen and what to do when it does happen. I think in Alex and Cathy’s case, space and time was all they needed, and by the evening they were fine. It was surprising to me given all of the traveling we did and the inclement weather we encountered that we didn’t really encounter any moments of tension. Perhaps I’ll chalk that up to my laid back nature; HA! Just joking Cathy, I know it takes two to make this happen. 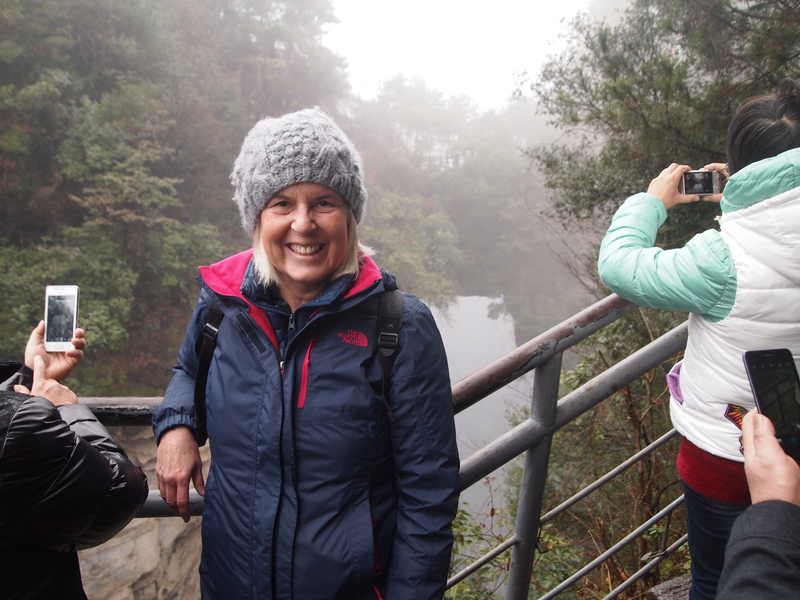 In looking back on my two weeks in China, followed by Alex’s two weeks, followed by Cathy’s trip to Myanmar, I am amazed at Cathy’s stamina, especially in light of the cough she came down with on our trip. Both Alex and I were exhausted after our short journeys. I can’t even begin to imagine doing that for six weeks. Cathy is like the Energizer Bunny, she keeps going and going and going!!! 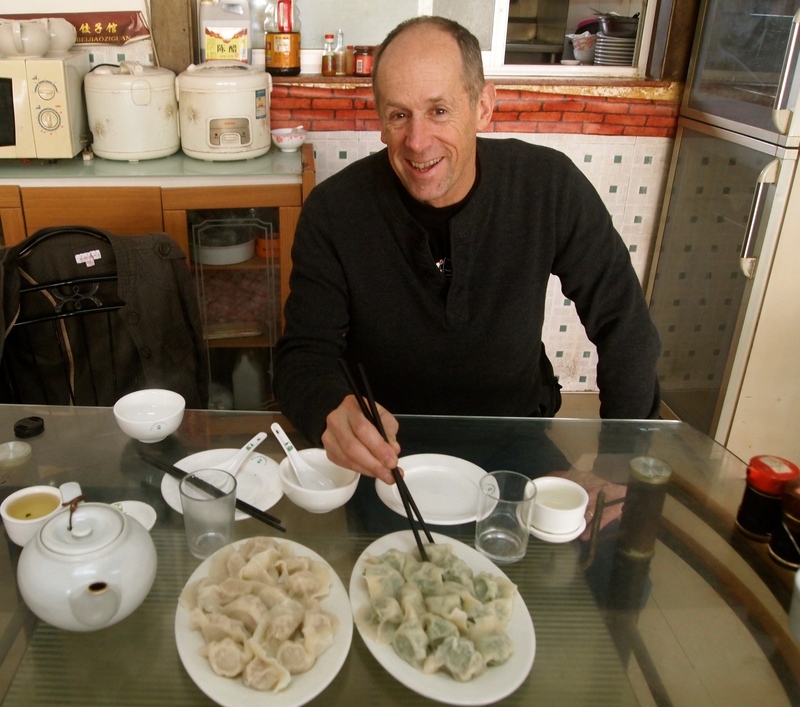 As I left China I realized that this was truly a once-in-a-life experience. It is an experience that for myself, and for Alex, will resurface in years to come as we put global events into perspective, as a result of having the opportunity to glimpse a way of life so different from our own. I am thankful for that opportunity. 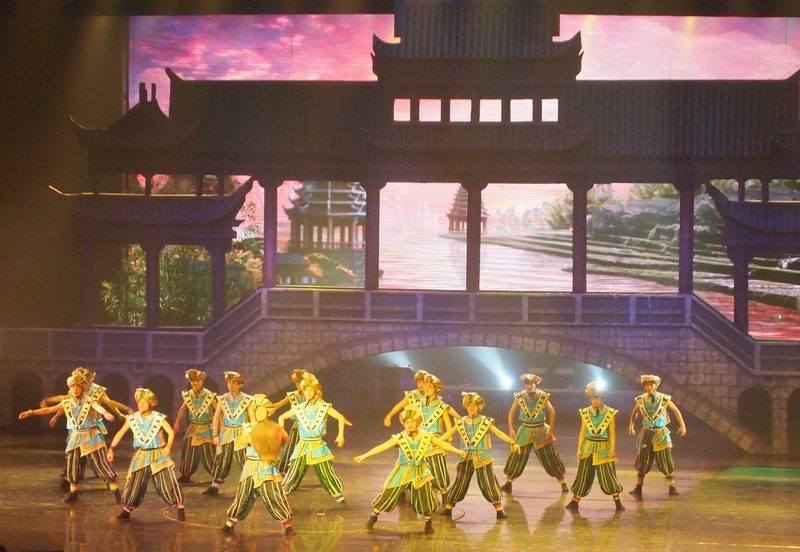 Sunday, January 25: After our disappointing day in Zhangjiajie National Forest Park, we at least have a show to look forward to: “Charming Western Hunan.” We eat a nice dinner in the hotel, then walk next door to the theater to see an acrobatics and dance show. 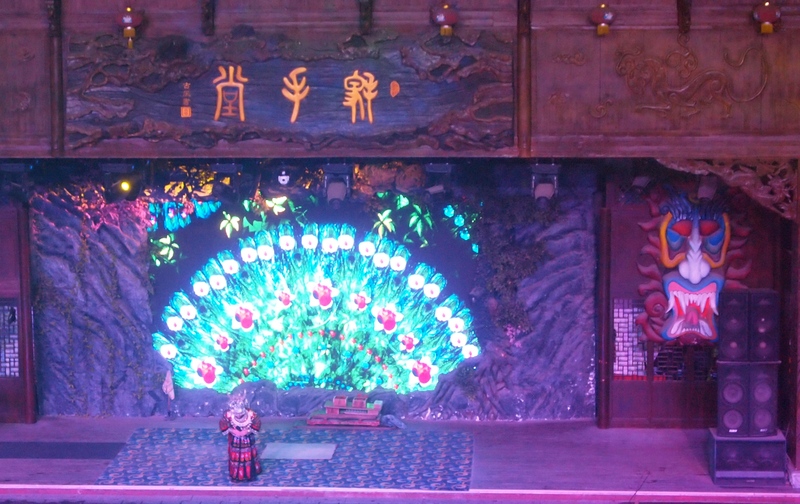 I love how the walls of the theater have Chinese-style carved railings and red lanterns. As is usual in Chinese public buildings, the space is not heated, so we stay bundled up in our jackets for the show’s duration. 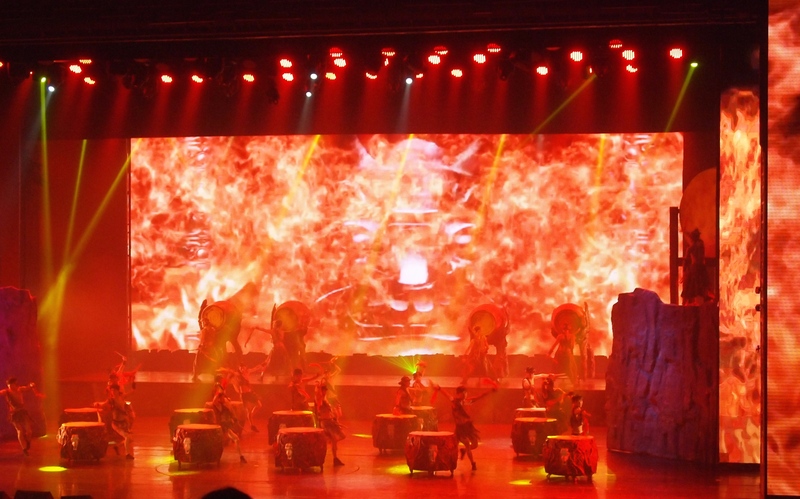 I’ve seen a number of Chinese shows by now, and they’re always impressive in the way they use backdrops, lighting and sound effects. They always seem to create either a magical fairy-tale land, or a land beset by violence and war. 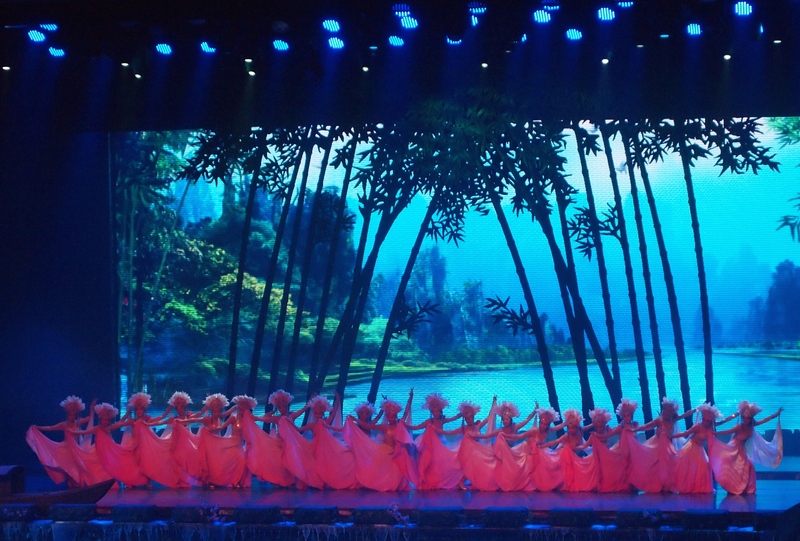 The show is impressive, but not as good as many I have seen. This one has several unrelated dance numbers, so it doesn’t tell a story. Toward the end, there is a lot of talking by one person about various things that I can’t understand because it’s all in Chinese. 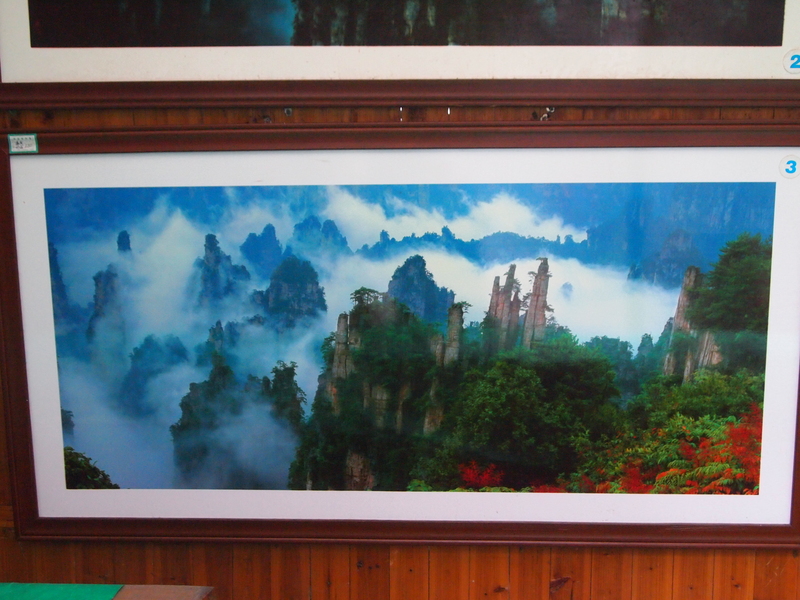 I think what she talks about is the history of Hunan province and the ethnic groups that make up the province. But who knows, really? 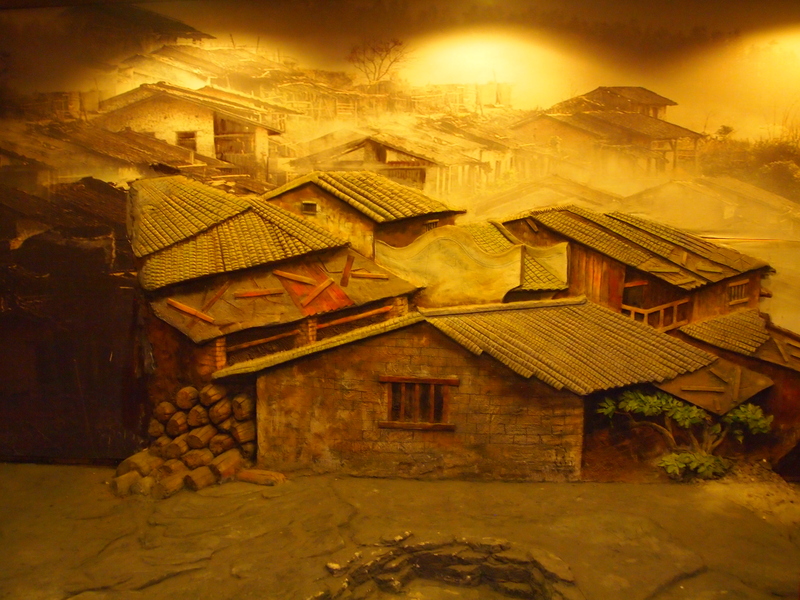 We leave the theater, thinking the show is over, and we find this diorama of a traditional Chinese village in the lobby. 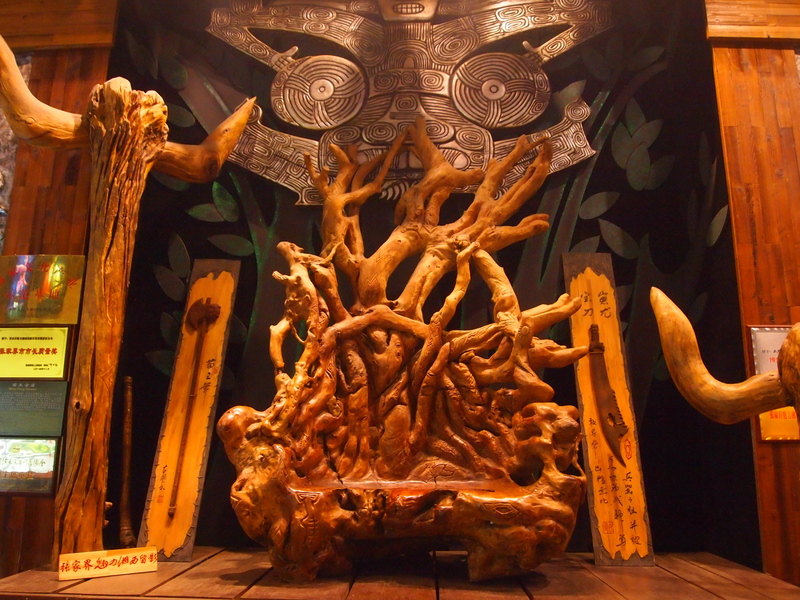 We also find an interesting wood carving with a fierce-looking face hovering over it. When we walk outside, we find there is an outdoor theater as well, where people are doing all kinds of daredevil performances. In one instance, a man lies down and blocks of wood are piled upon him like a pyramid; a lot of people come to stand on those blocks of wood. It looks like the poor man underneath would be crushed to death by all that weight. 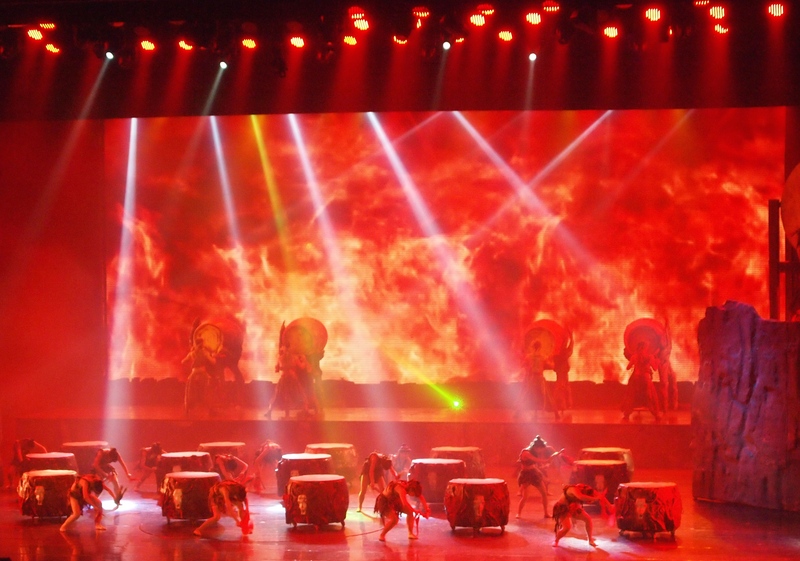 One of the performances really freaks me out, so much so that I have to leave. I don’t take a picture because the light is so terrible, but now I wish I had at least tried. A huge curved sword is brought out to the stage. The sharp blade is facing up, and a man stands barefoot at one end of it. He bends over and takes a piece of string and pulls it over the sword’s edge, slicing it cleanly to show how sharp it is. Then he walks slowly down the curve of the sword barefooted and balancing on its sharp edge. I can barely watch as I can’t stop imagining him slipping and falling and getting cut in half vertically!! That is not something I want to see. I would be traumatized for life. 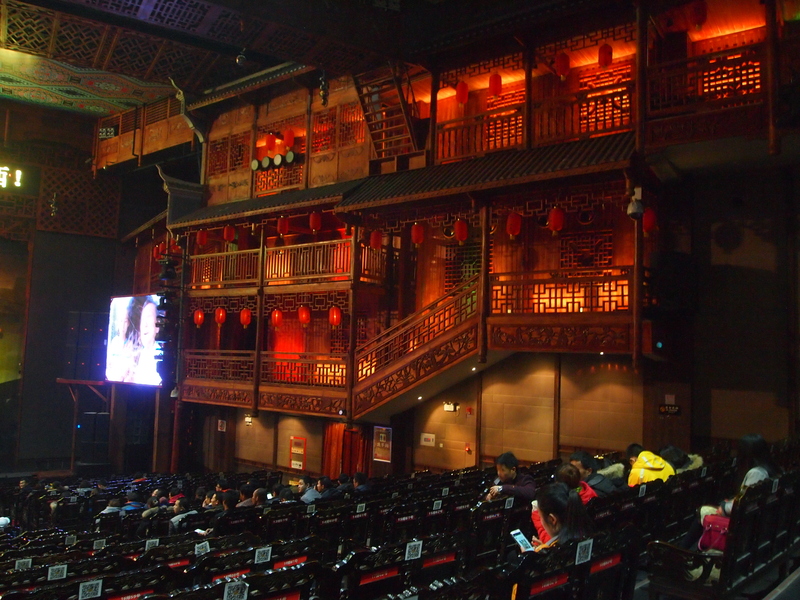 It’s freezing standing outside at this theater, but the Chinese are very tough characters, used to living without heat or air conditioning in most aspects of their lives. They seem willing to stand and watch for the duration. Meanwhile, as a spoiled Westerner who’s already been suffering in the cold and fog all day, I am tired of being cold. 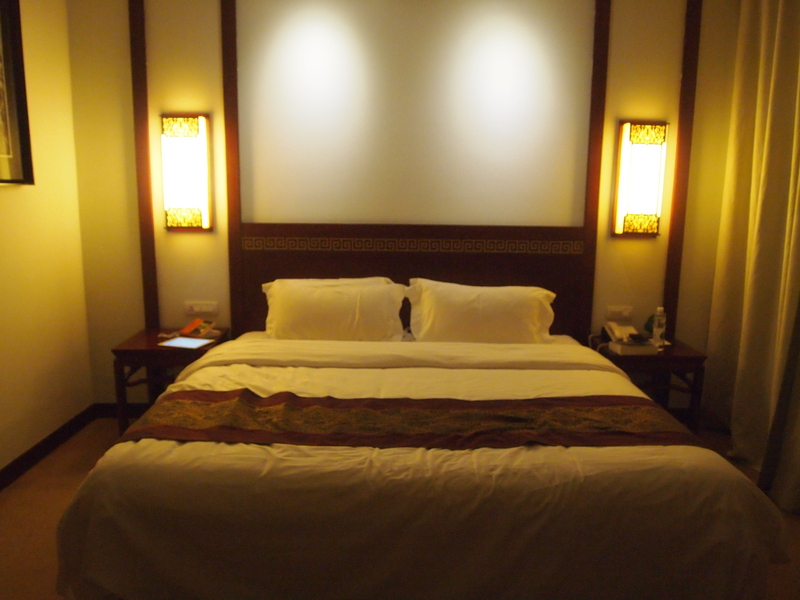 We leave early to return next door to the hotel, where we get warm and toasty in our room. 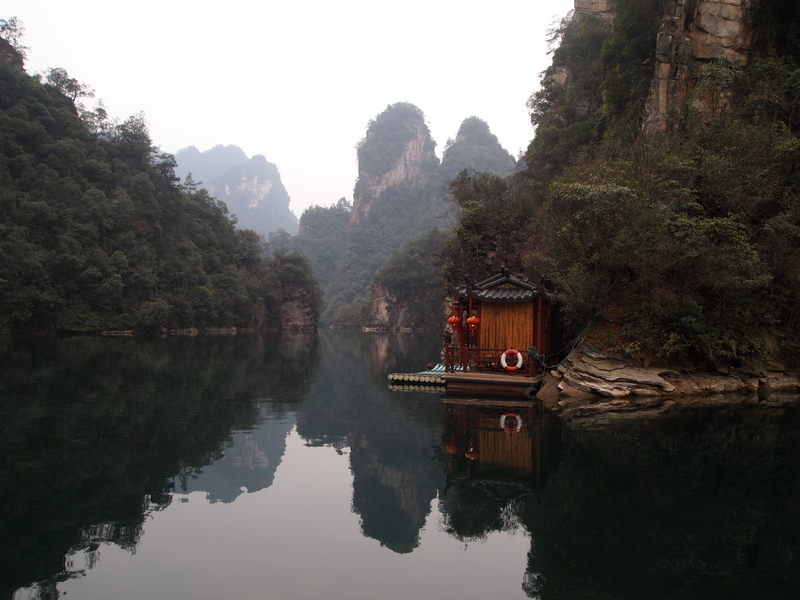 We leave tomorrow for Guilin. With a day of travel ahead, all I want to do is relax. 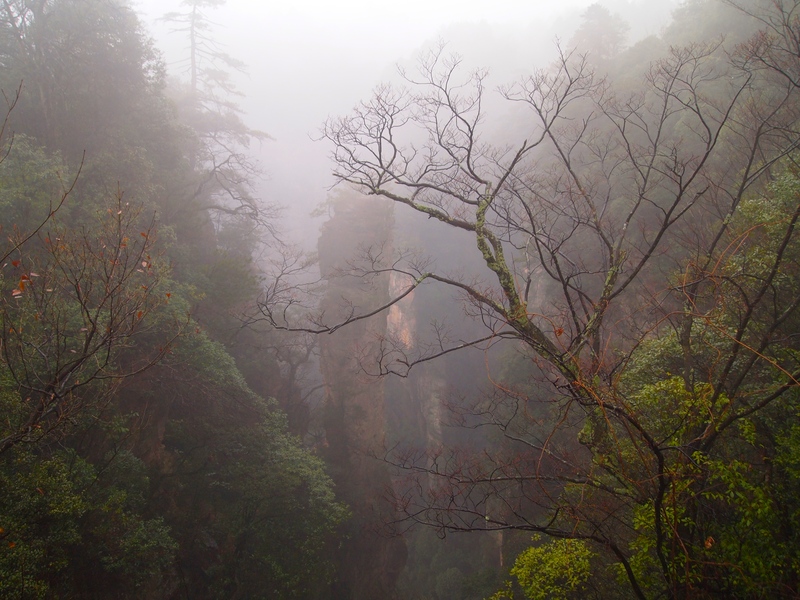 Monday, January 26: Today, we have a flight from Zhangjiajie to Changsha, the capital city of Hunan province, from 1:10 p.m. to 2:15 p.m. When we arrive at the Changsha airport, we have to get quickly to the Changsha train station for a 4:17 p.m. train to Guilin. We’re due to arrive in Guilin by 7:47 p.m.
We make the mistake of arriving way too early to the Zhangjiajie Hehua International Airport. This is a really small airport, one of the smallest I’ve ever seen. It’s not heated and there is not a single shop open to grab a bite to eat or to get some coffee or a drink. It’s an extremely long wait for what appears to be the only flight going out of the airport for the day. 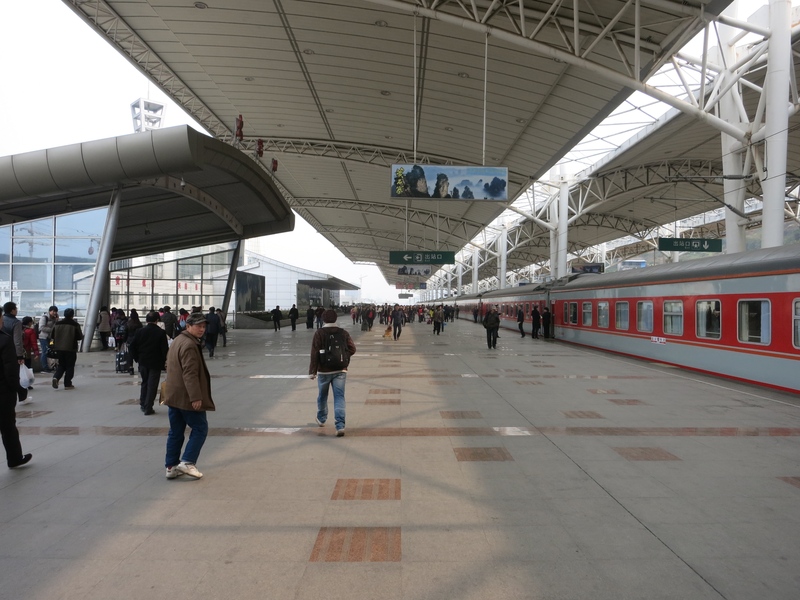 Not only that but the boarding starts late, making us nervous about making our train connection in Changsha. The airline has the reassuring name of Okay Airways and it’s China’s first private sector airline. It’s a small old-fashioned propeller plane, but the flight is comfortable and without incident. 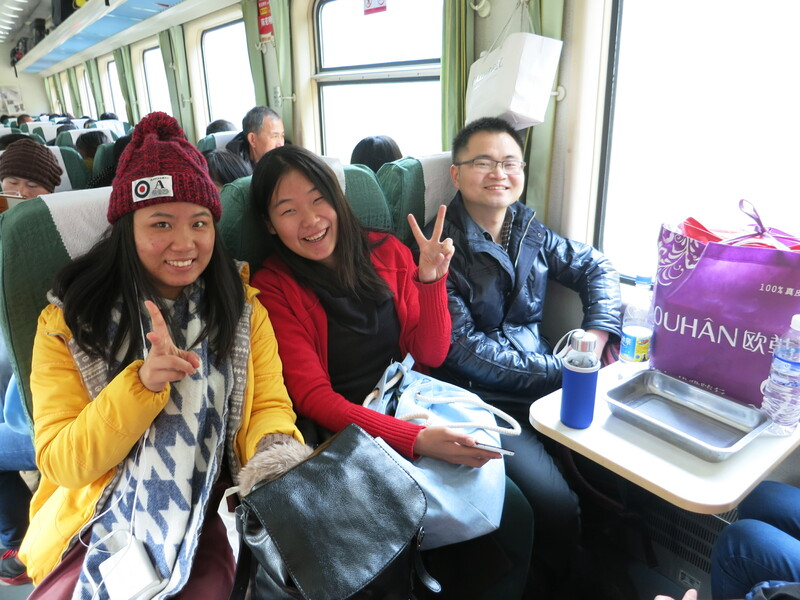 It turns out we make it to Changsha with plenty of time to get to the railway station. We take a taxi to the huge train station, where we immediately find a McDonald’s to grab a quick meal. 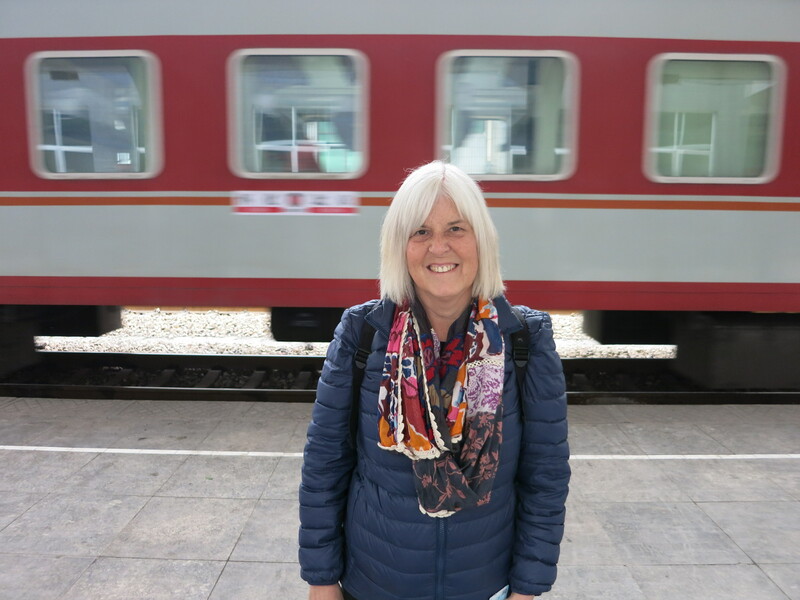 Then we get on our train for the 3 1/2 hour train ride to Guilin. 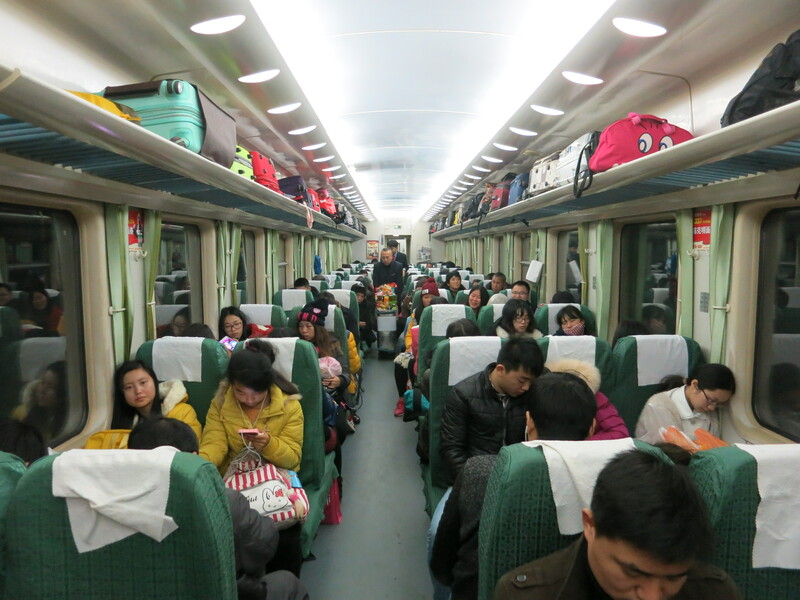 Luckily, it’s a fast train, with comfortable seats and not too frequent stops. 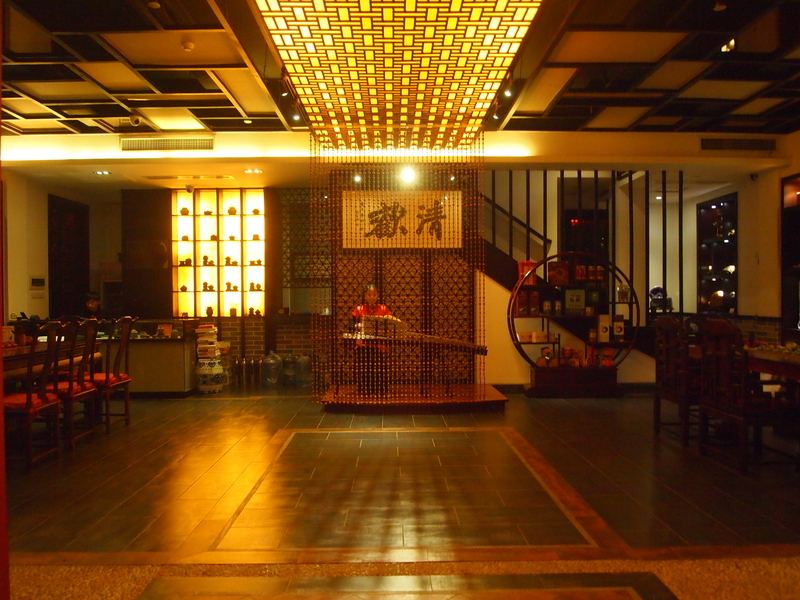 By the time we arrive in Guilin, it’s dark, and we find a taxi at the taxi stand to take us to our hotel, the Guilinyi Royal Palace, which is on the grounds of the Guilin Central Park, the city’s botanical garden. We get dropped at a gate outside the botanical garden, where an electric cart waits to pick up hotel guests. 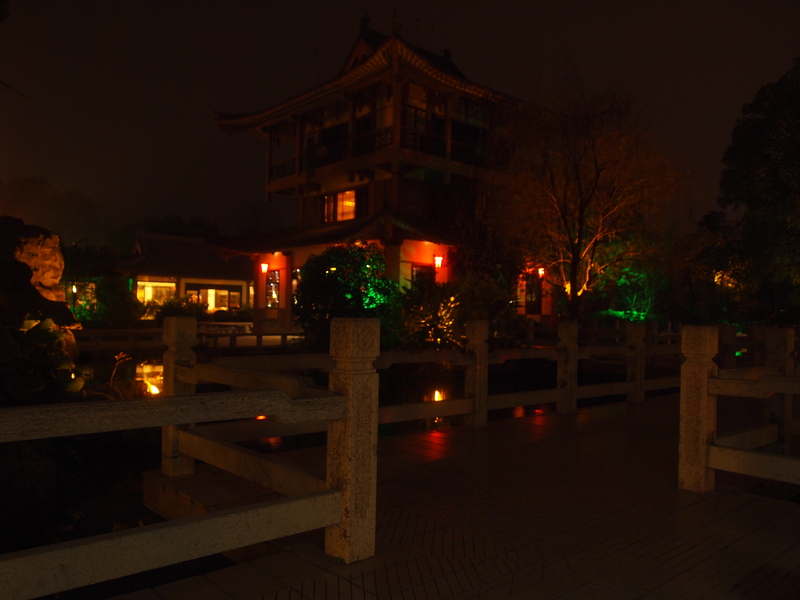 Here’s a view of the hotel at night. 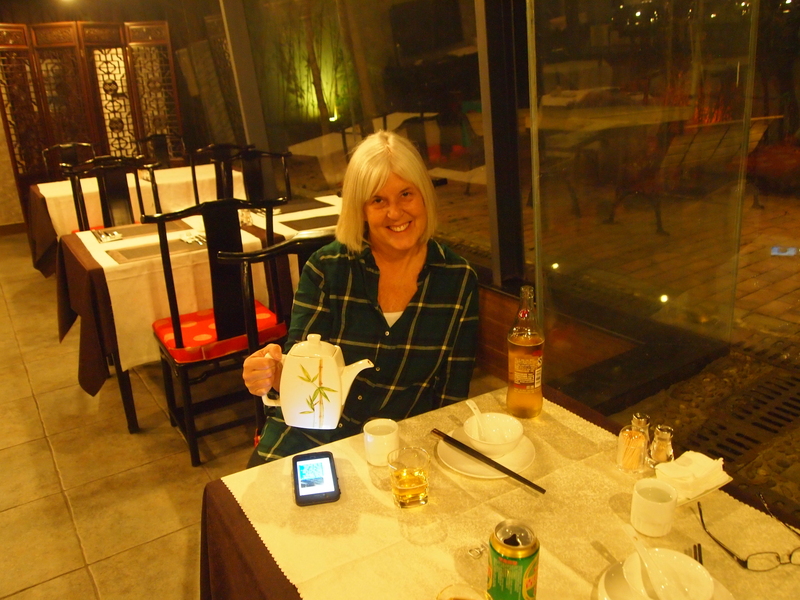 We’re starving, so we go immediately to the restaurant, where we order a Chinese meal accompanied by beer and tea. 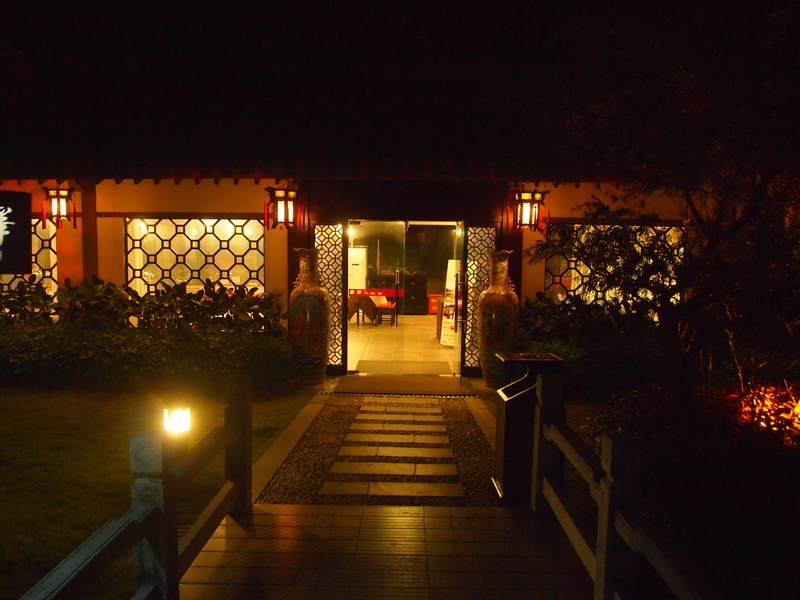 There is a tea room where you can stop in for a tea ceremony. It seems pretty deserted. I’m not a tea drinker, so we opt not to go in. However, we can hear this woman playing a delicate melody on a traditional instrument. 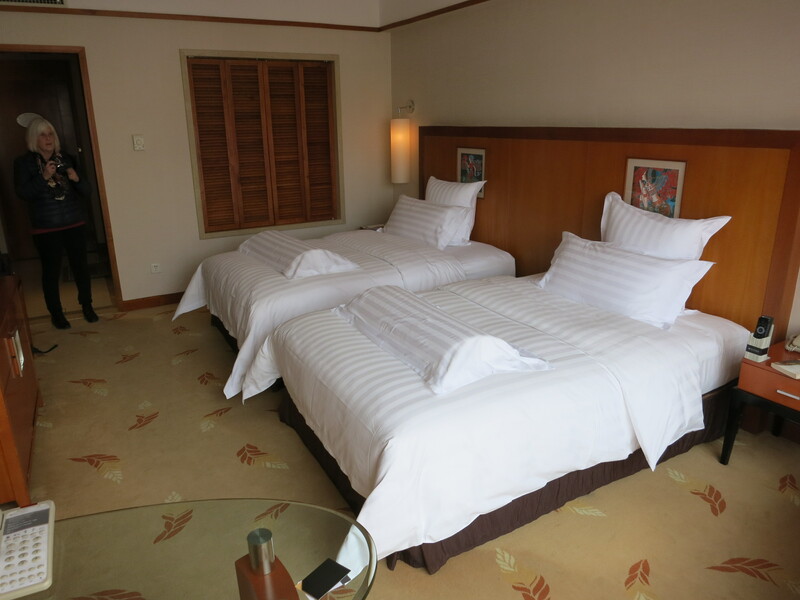 Finally, we can relax in our room. 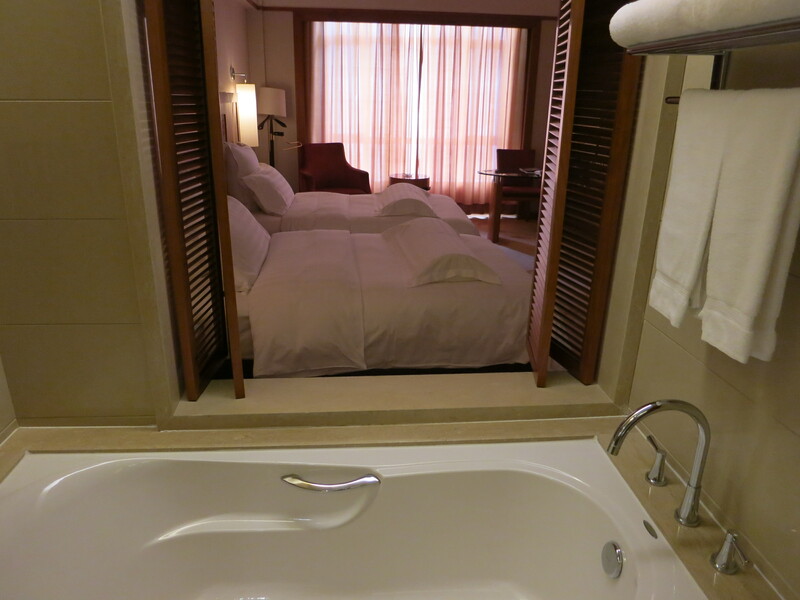 This room, like the Hotel Pullman, also has a bathtub. 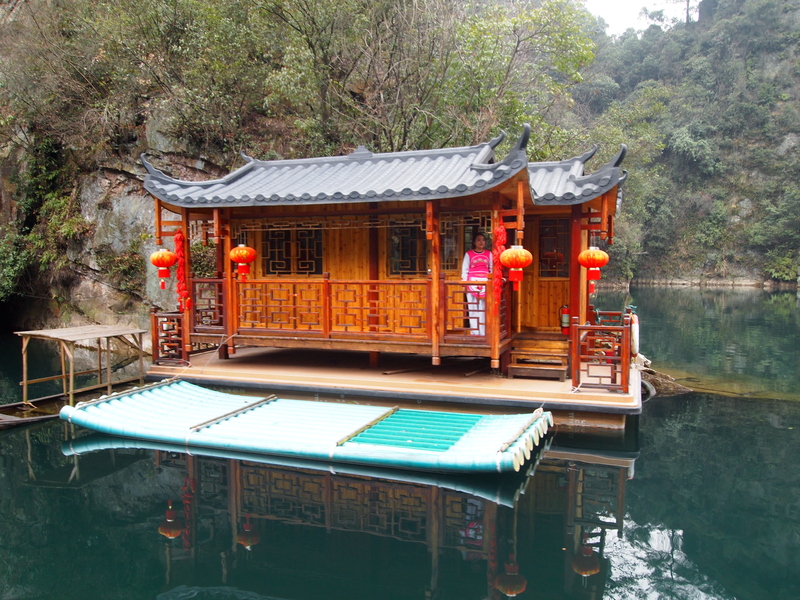 This of course is a rare treat in China, so I always take full advantage by taking baths in the morning and at night. 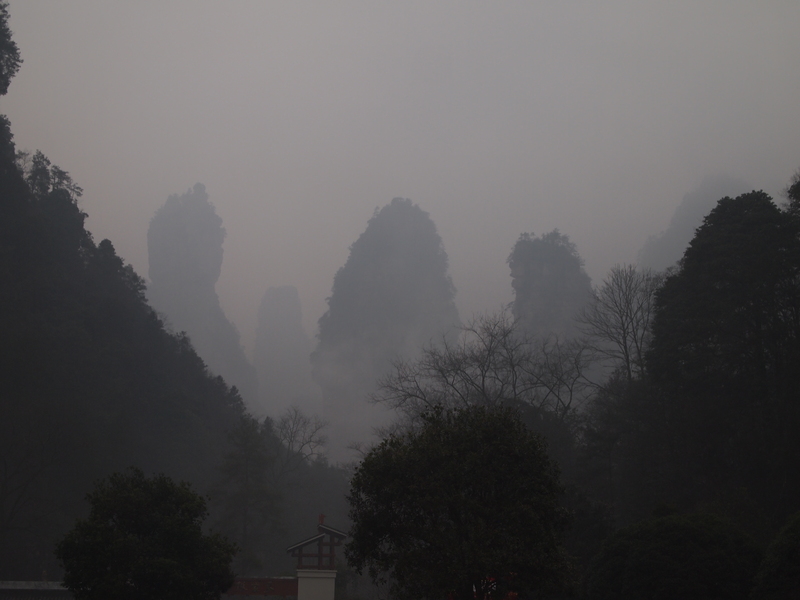 We plan to take our time leaving in the morning for Yangshuo. The forecast is for more rain and clouds, so what’s the rush? It won’t be the same as when I went in October, at which time I had warm and somewhat clear skies every day. Sunday, January 25: The forecast for today is as bad as it was yesterday, but as it’s our last day here, we’ve hired a guide to make sure we see the best of what there is to see in the shortest amount of time. 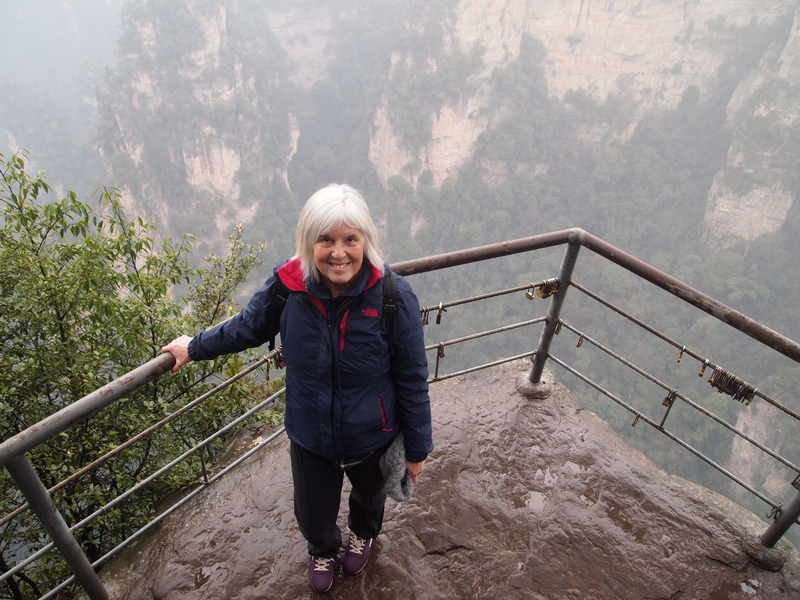 She meets us at our hotel at 10:00 and we head by taxi to the entrance to the park and then directly by the park bus to the Bailong Elevator, which will take us to the heights of Zhangjiajie National Forest Park. 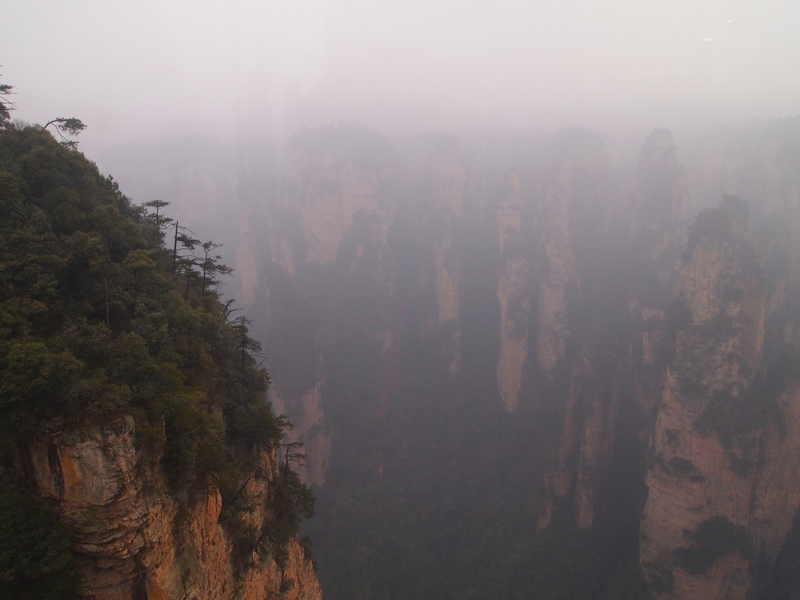 According to Prafulla.net:‘The Bailong Elevator’ at Zhangjiajie National Park, China : The Highest and Heaviest Outdoor Elevator in the World: Zhangjiajie Bailong Elevator (Chinese百龙天梯) is a glass elevator built on the side of a huge rock in the Wulingyuan Scenic Reserve in Zhangjiajie, China. It is 1070 ft (330m) high and claimed to be the world’s tallest glass elevator. It is the highest outdoor elevator in the world and it has three Guinness World Records: 1) World’s tallest full-exposure outdoor elevator; 2) World’s tallest double-deck sightseeing elevator and 3) World’s fastest passenger traffic elevator with biggest carrying capacity. However, due to the potential harm caused to the surrounding landscape, its future remains uncertain. 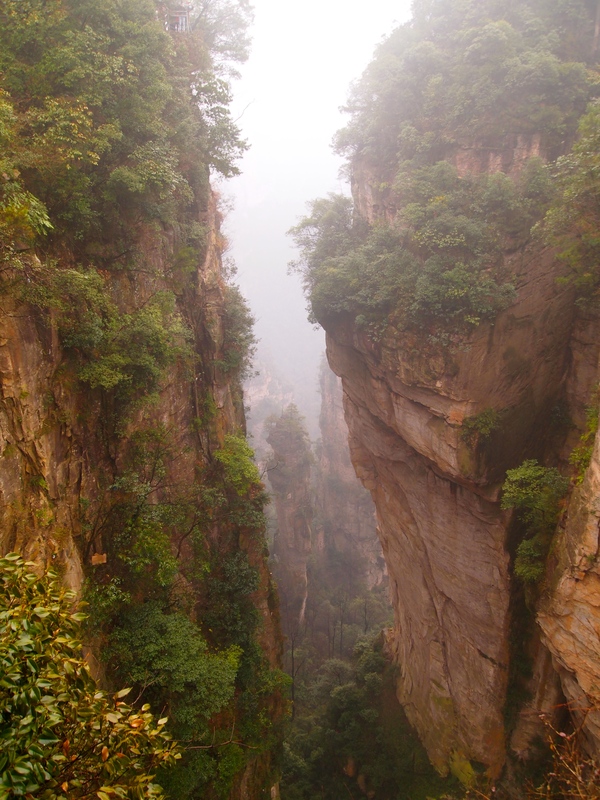 According to Top China Travel.com: Bailong Elevator: Bailong Elevator, or Hundred Dragons Elevator, includes three exposure sightseeing elevators running parallel to one another. Each elevator can take 50 passengers every time and the speed is 3 m/s. If the three elevators run simultaneously, the amount of one-way passengers can reach 4,000 per hour. 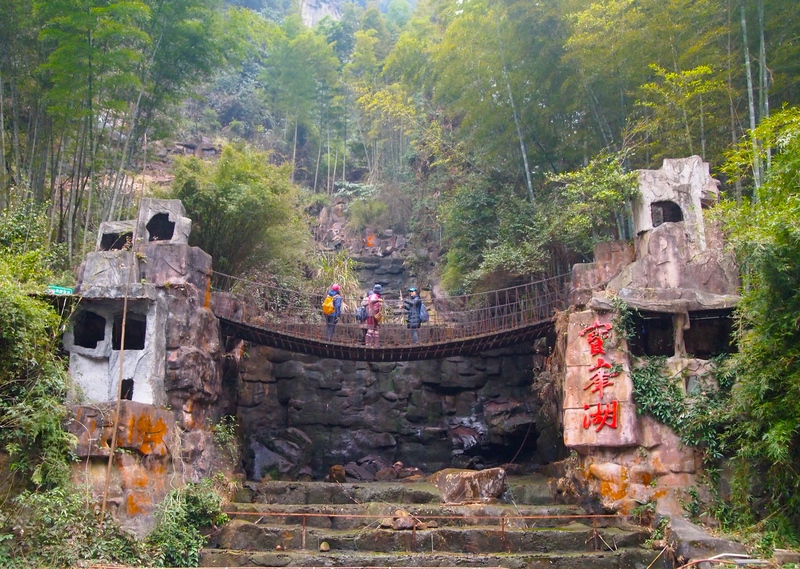 The Bailong Elevator allows people to “go sightseeing up the mountain during the day,” and return to the bottom by nightfall. So it provides convenience in transportation for visitors. 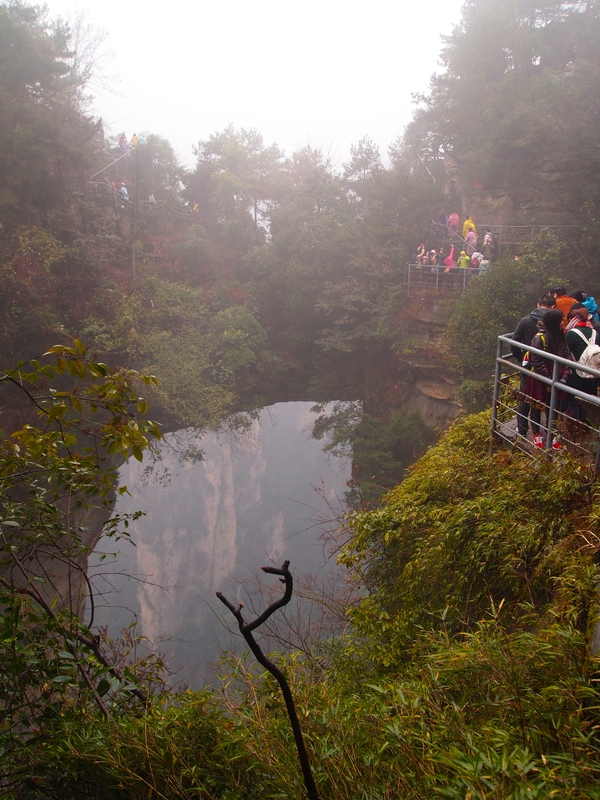 Moreover, passengers can access amazing scenery on the elevator, including the World Bridge of Yuanjiajie, Wulong village and Yangjiajie. 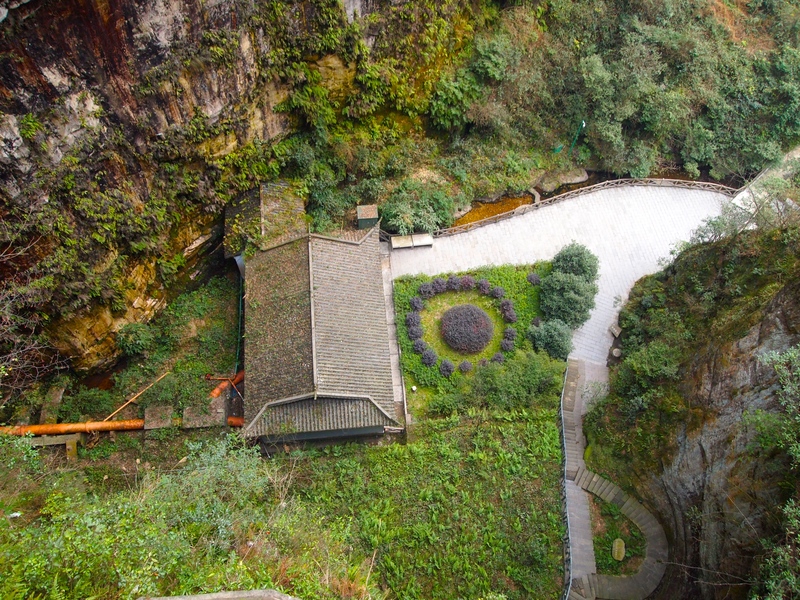 The elevator integrates Mount Tianzi, Yuanjiajie, and Jinbian Stream as a single entity, solving traffic bottleneck problems in this scenic spot. Sadly, I don’t take a picture of the elevator to show here, because I actually think it’s quite ugly. You can see the actual elevator on one of the links above. 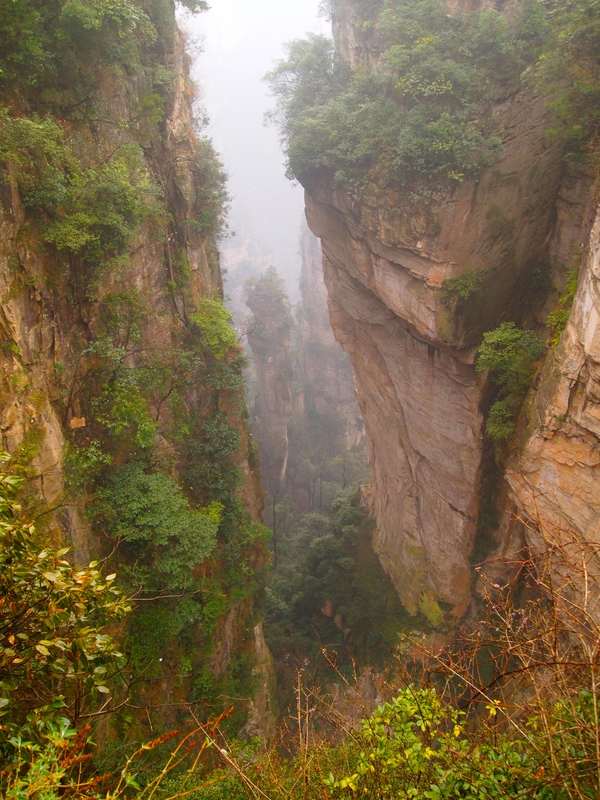 Prior to the elevator’s opening in 2002, it took visitors more than three hours to drive on dangerous mountain roads to Yuanjiajie. 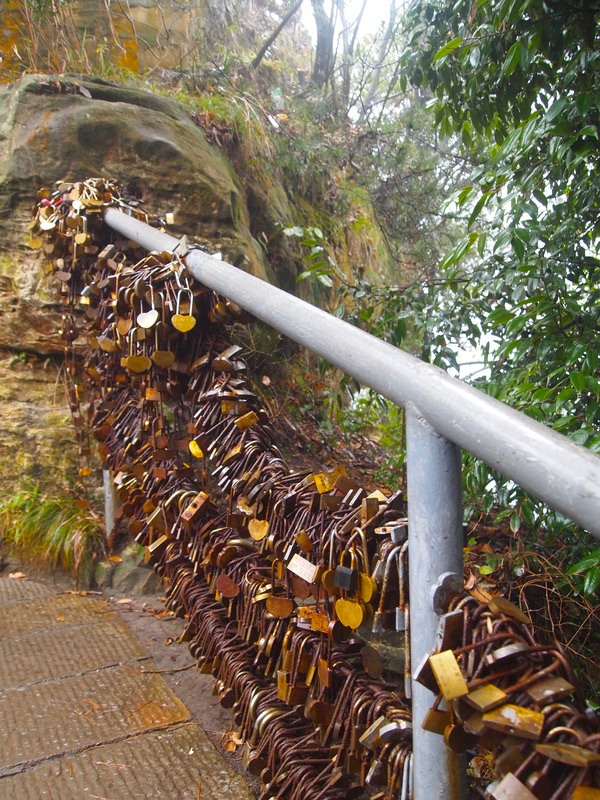 It took more than five hours if you drove from the foot of mountain to Yuanjiajie scenic spot. Since Bailong Elevator has been accessible to visitors, the time has shortened to one minute and 58 seconds, which is considered to be a miracle. We pay a lot of money to be whisked quickly up the elevator to the walkways built along the heights of the National Park. The fog is so thick today you could stir it with a spoon, but as morning fog usually yields to clear skies later in the day, I figure it will get better as the day progresses. I am dead wrong. Our guide Kathy is one of the ethnic minority people who lives in the area (I can’t remember which minority). At the top of the mountain she sings us a native song. 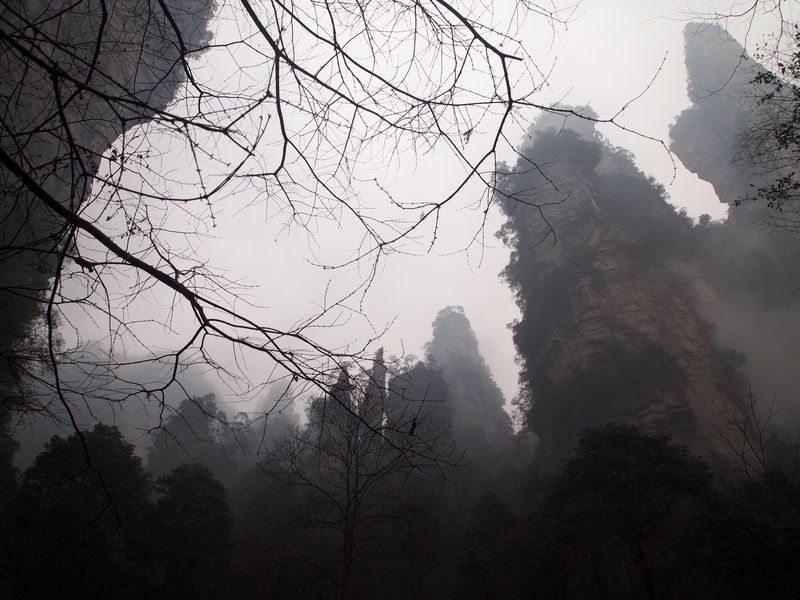 I would put my video on YouTube and link to it here, but YouTube is nearly impossible to use in China. Maybe when I return to the USA, I’ll be able to post it. I’m sure she’s thrilled to be taking people on a tour here on this dreary and cold day. 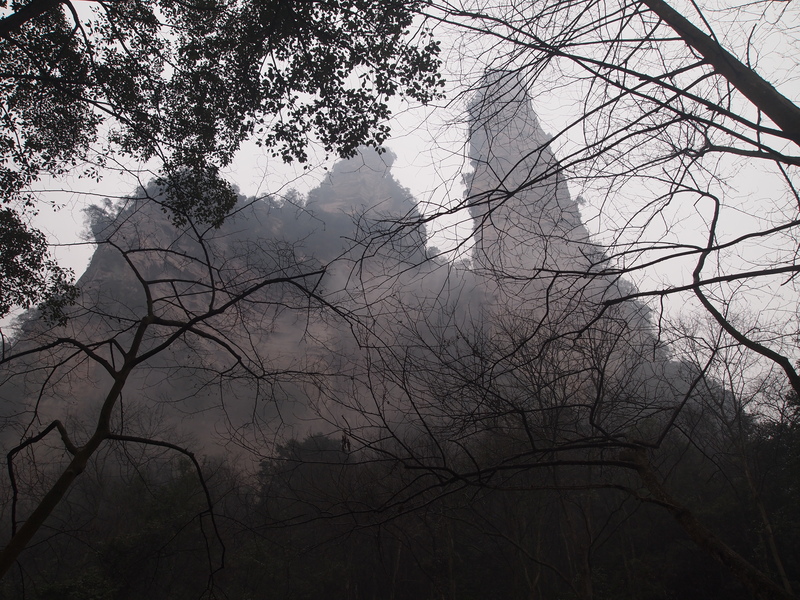 We get some glimpses of the park’s pinnacles early on. I’m not kidding. We can’t even see the outline of the famous mountain that looks so pretty on the placard. I honestly want to cry. I am so frustrated that this fog won’t allow us even a glimpse of some of the beautiful mountains here. 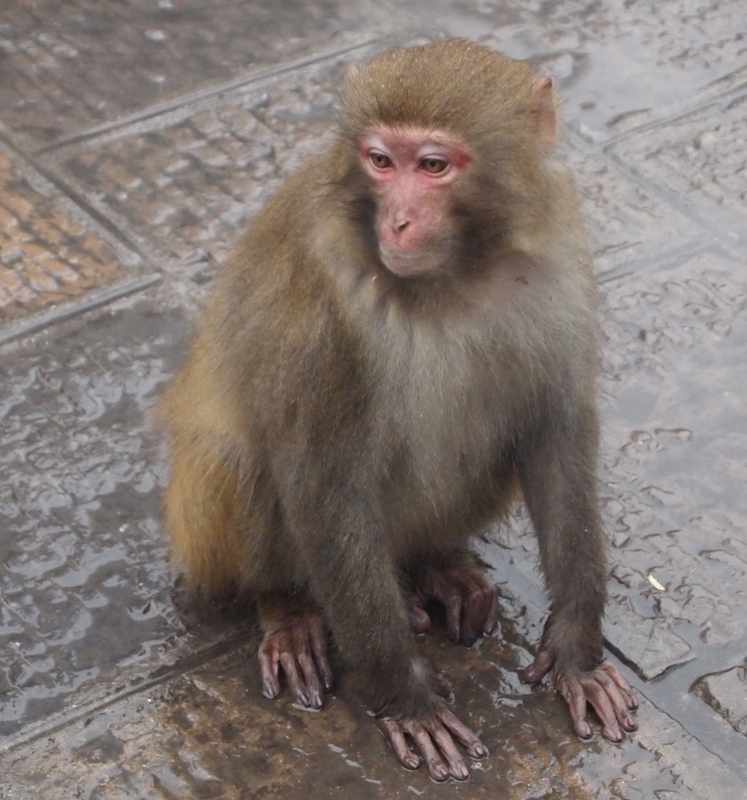 We do get so see scores of monkeys climbing over the trees and the walkways and the railings. One of them even jumps on a girl’s backpack as she’s walking and tries to take some food from her. She screeches, as I suppose I would do too if a monkey jumped on my back! We continue on the walk and I feel increasingly depressed and frustrated. I have so looked forward to coming to this place. 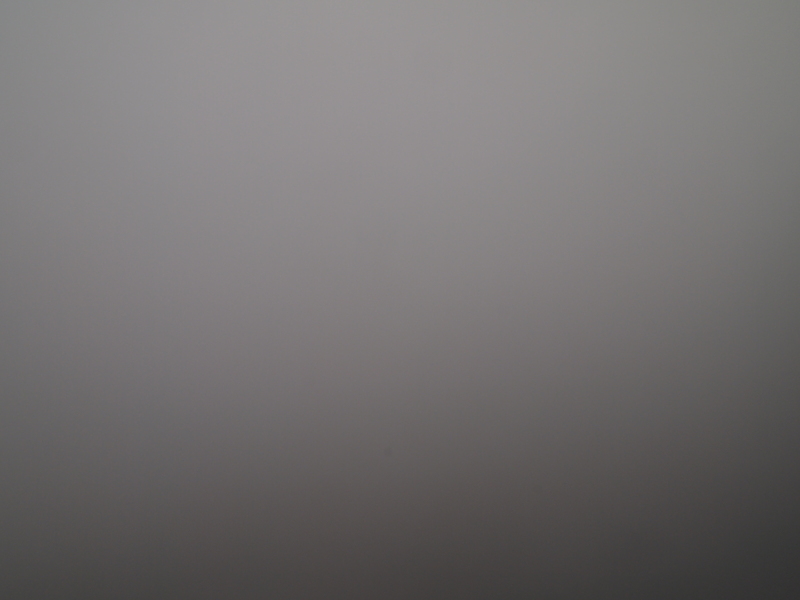 I’ve dreamed of having wonderful pictures to share, but all I can see is fog. In some spots, the wind is blowing and the fog looks more wispy than in other places. I stand in those areas for a long time, determined to wait until the wind blogs the fog away, if even for a split second, so I can see the mountains. Here’s a gallery of some of what I see, but it isn’t much. See, you can almost see! Look. If you squint hard enough you can see them? Right? There are a couple of better views along the way as the fog does clear intermittently. We continue on until we come to the No. 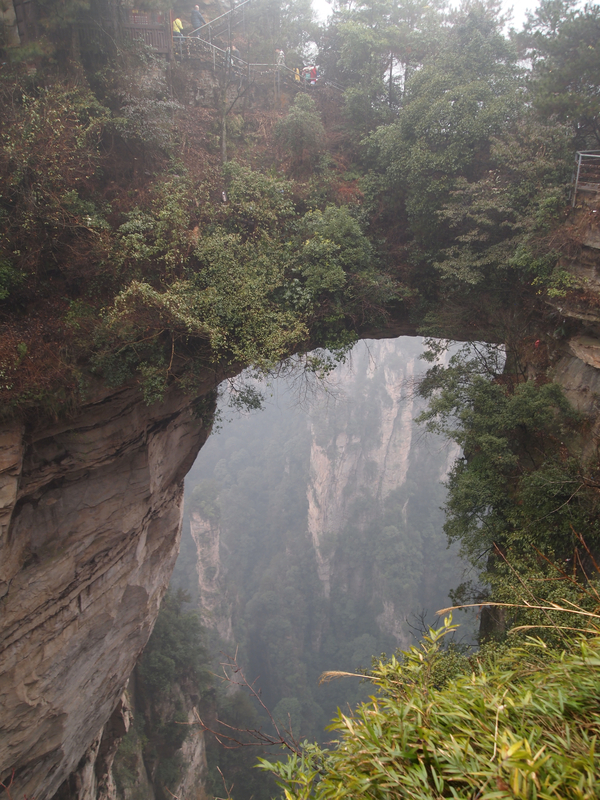 1 Bridge in the Earth. 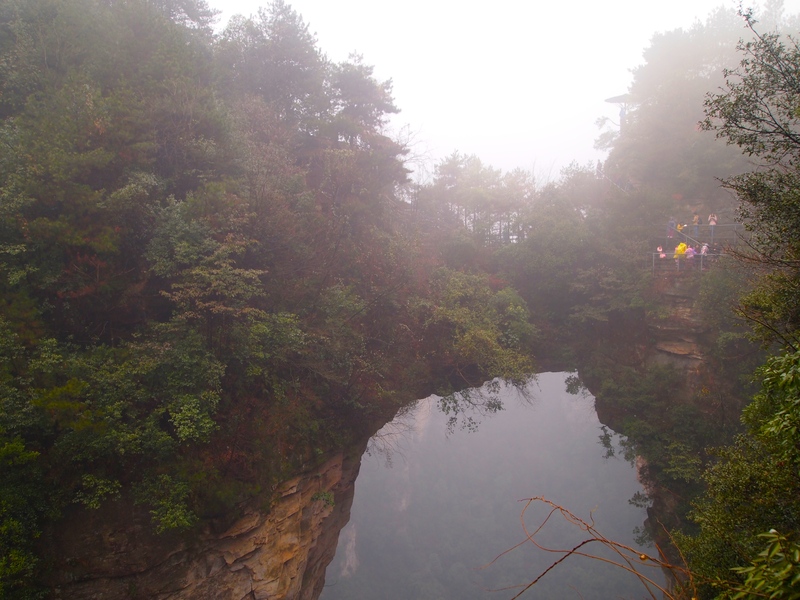 A stone near the bridge says: This natural bridge connects the natural moat with a span of 50 meters, a height of 350 meters, a width of 4 meters, and a thickness of 5 meters. 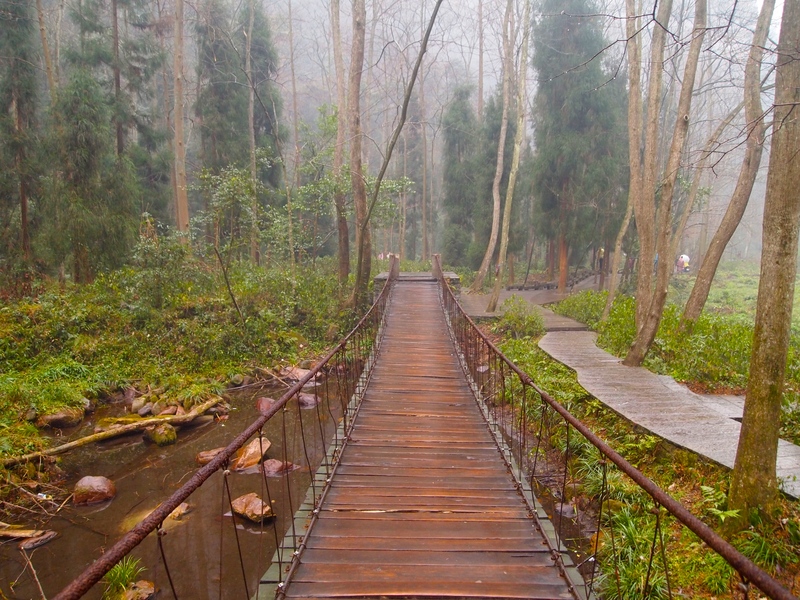 When sunny, the bridge opening is obviously seen, when rainy the fog drifts in with sounds. I’m trying to smile, but you can see it’s difficult. I really want to cry and feel like I’m on the verge of doing so. Can you tell? We look out on the opposite side of the No. 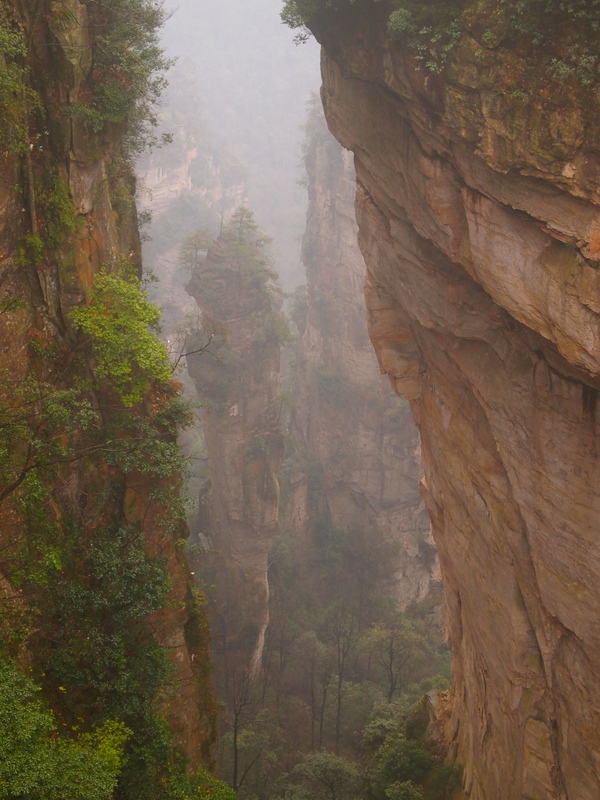 1 Bridge in the Earth, and we can barely see some of the pinnacles on the other side. This must be beautiful if you could see it! 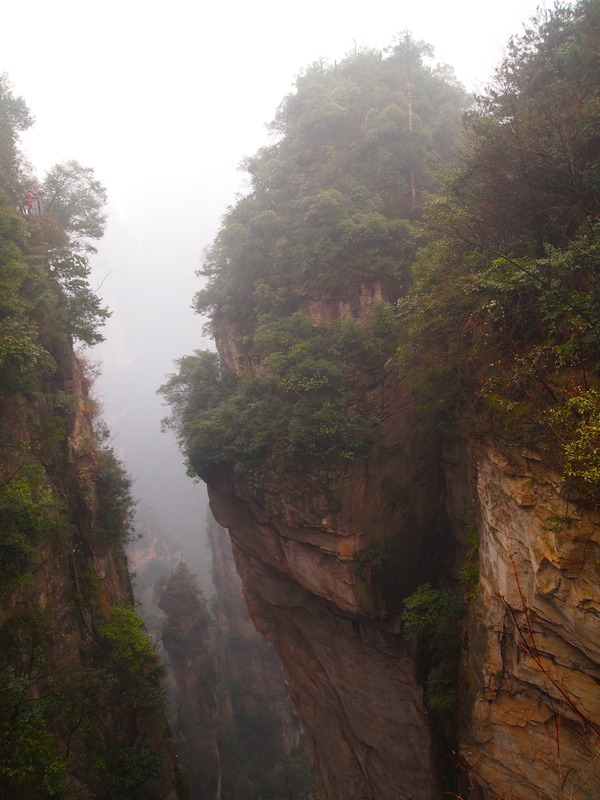 After our walk, we walk to another mountain, where I stand on the edge of a steep precipice. 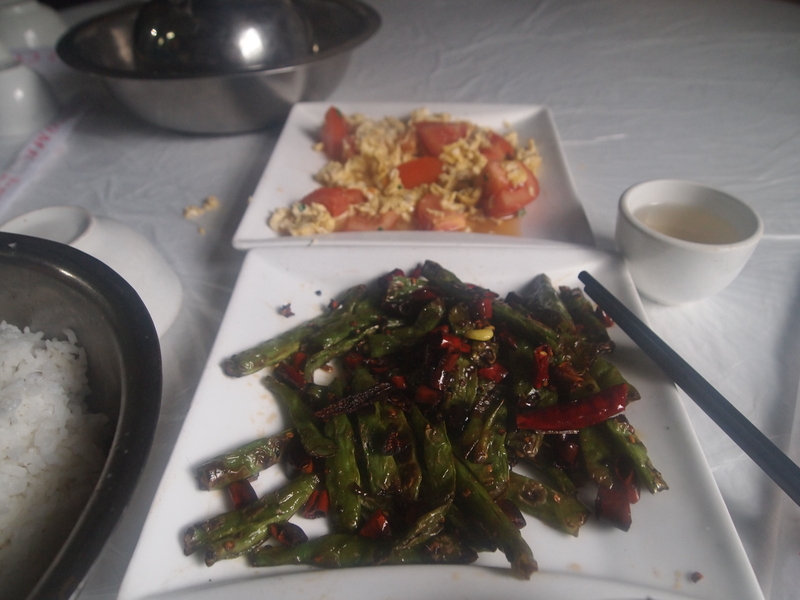 Finally, we make it to a lunch place where we order my usual Chinese dishes of salty green beans sautéed with hot peppers and scrambled eggs with tomato. Our guide tries to take us to an old village on the mountain. We start to go in, but when she tells us we have to pay another entry fee, we decline. I’m too depressed to go further. Every bit of this trip has cost us a fortune, from hiring the guide, to paying the fee to go up the elevator to coming back down the elevator. The fees are endless at this place. As we’re returning to take the elevator back down, we come to this statue of Marshal He Long. 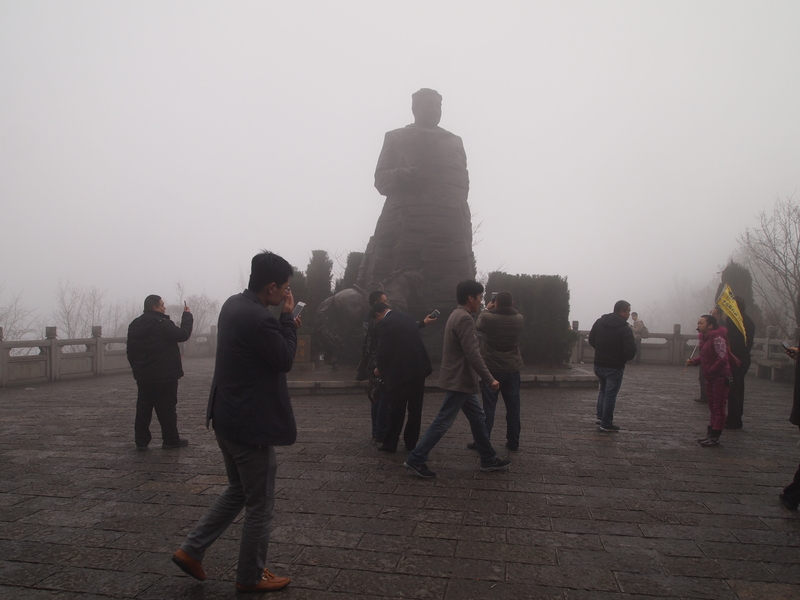 A group of Chinese businessmen are milling about and posing with the statue. He Long was a Chinese military leader who lived from March 22, 1896 – June 8, 1969. 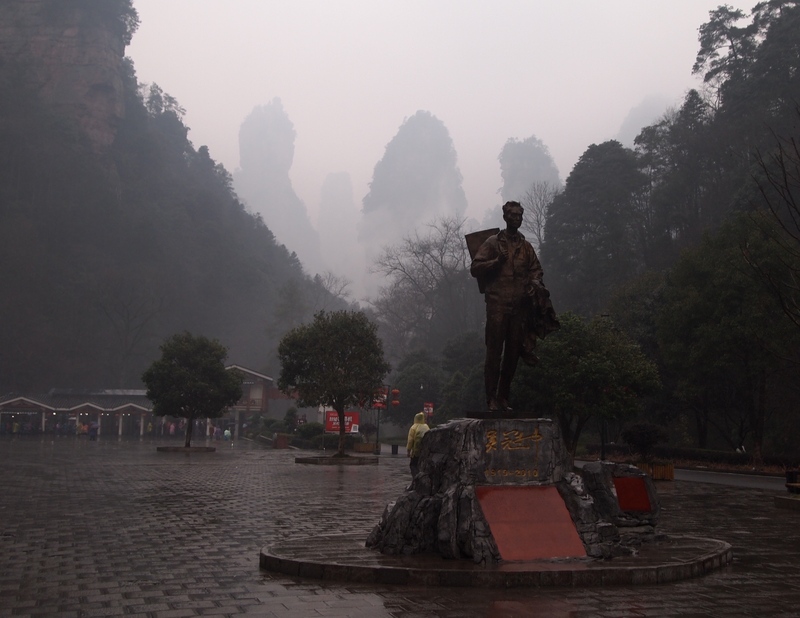 He was from a poor rural family of the Tujia ethnic group in Hunan, and his family was not able to provide him with any formal education. He began his revolutionary career after avenging the death of his uncle, when he fled to become an outlaw and attracted a small personal army around him. You can read more about him here: Long March Leaders: Marshal He Long. As we leave through the visitor’s center, we see these gorgeous photos of the park. 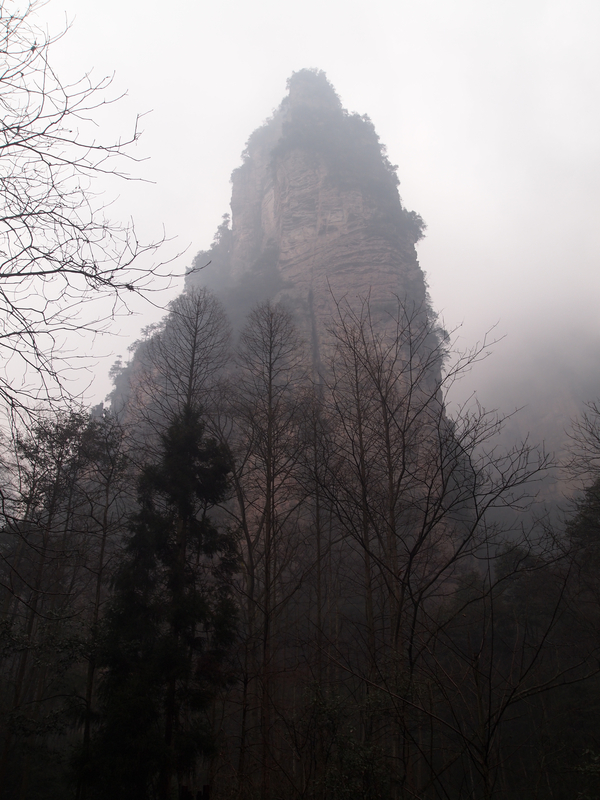 Here’s what Zhangjiajie should look like on a nicer day. 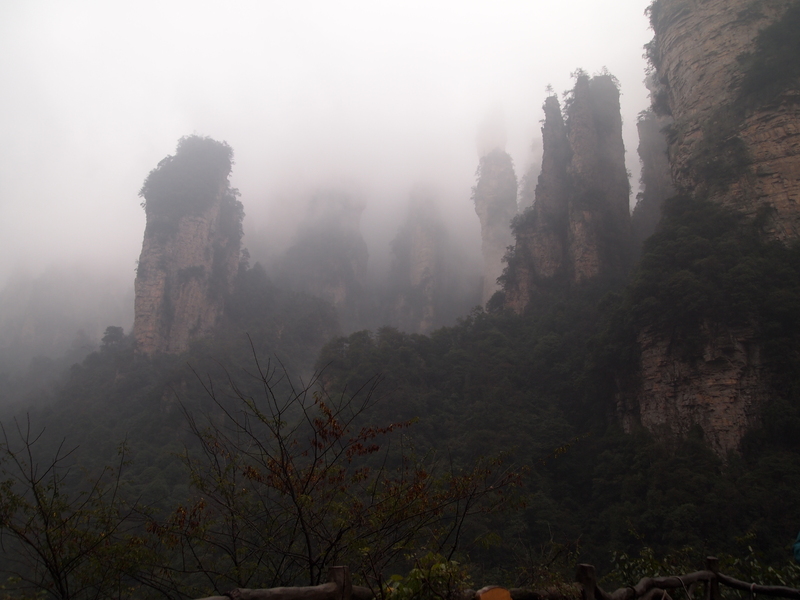 This is what Zhangjiajie SHOULD look like! Unless I someday make it back to the park, what I saw today is all I will ever see. Sadly, this will be my memory of the park: a mere suggestion of what it really is. 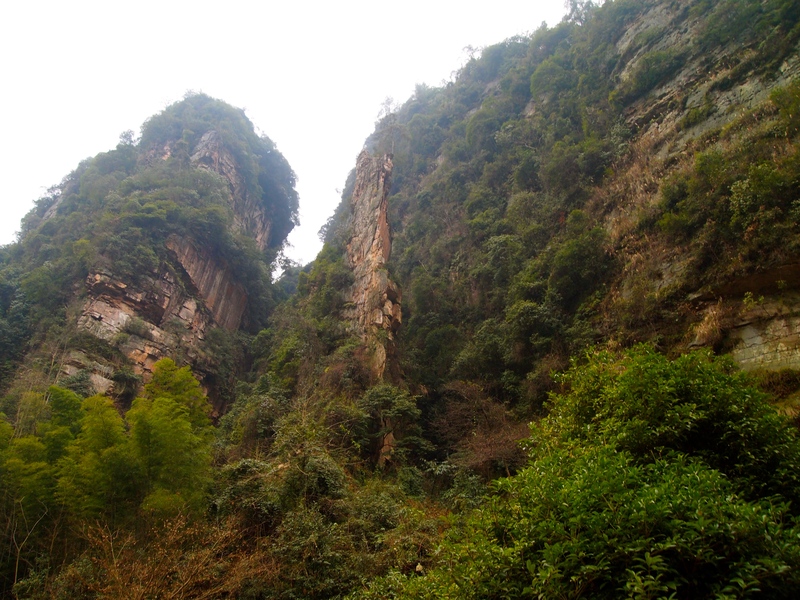 We take the park bus back to the entrance, where the bus driver is much more careful and slow-moving than yesterday’s driver, who careened around the many curvy cliffside roads to return us to earth. 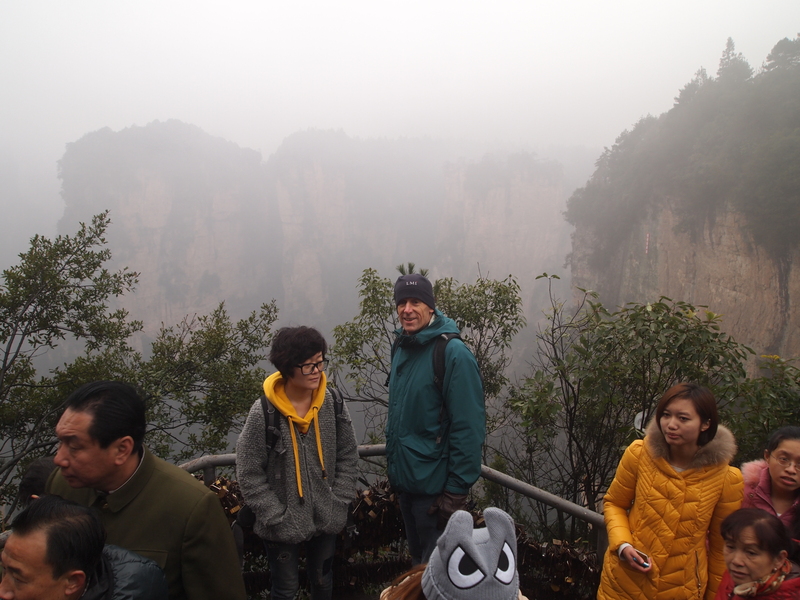 Saturday, January 24: Our next two days at Zhangjiajie National Forest Park are to prove incredibly disappointing because of steady rain, heavy fog, and biting cold. 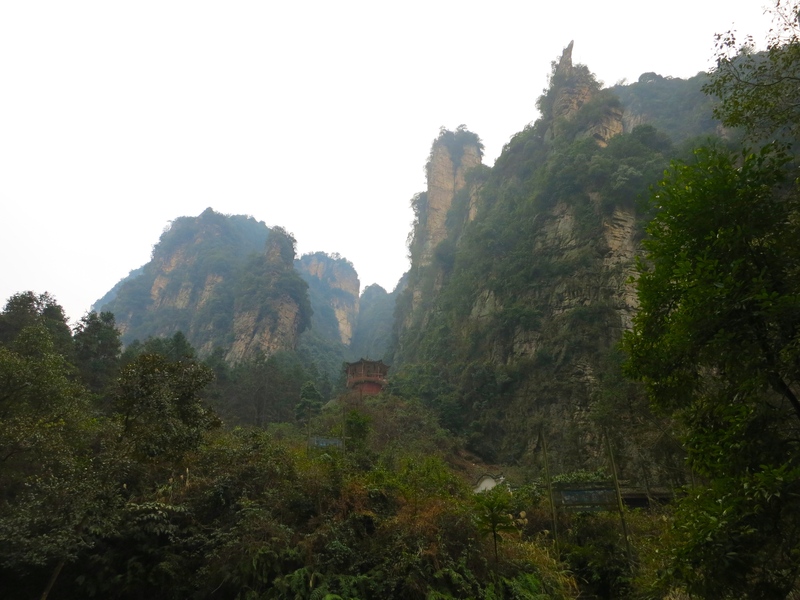 We are barely able to see the beautiful karst formations on the first day, and on the second day, when we climb to the higher elevations, we are often not able to see anything at all. In some spots, all we see is a bank of white fog without even an outline of the mountains that are beautifully pictured on placards. Outside of the park entrance, we are greeted by vendors selling cheap ponchos and shoe covers. We each buy a poncho, me blue and Mike yellow. I buy a pair of plastic camouflage-patterned shoe covers for my tennis shoes; Mike doesn’t because he has good waterproof hiking boots. I come quickly to regret this decision. 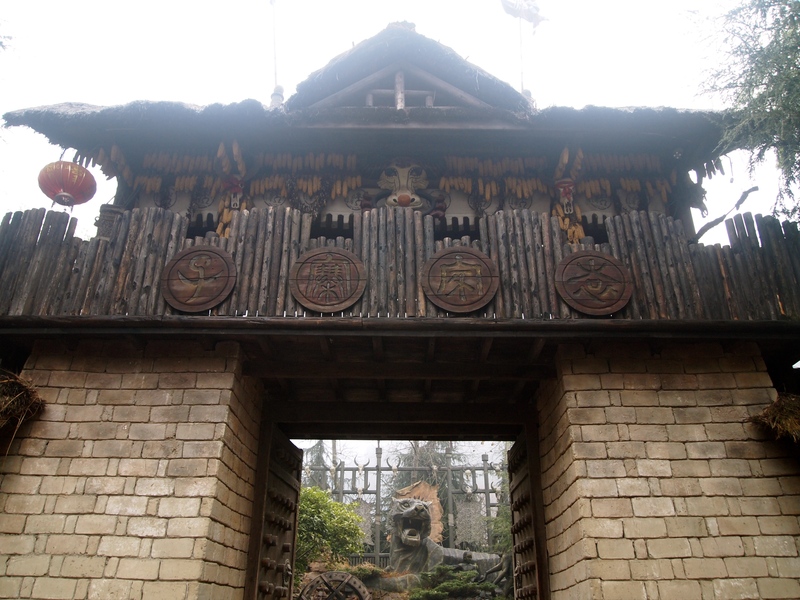 Inside the gate, we’re greeted on the walkway by the monkeys that occupy the park. They congregate where the tourists do, in hopes of getting some snack food, which they most certainly do. Chinese tourists love to share junk food with animals of all sorts. 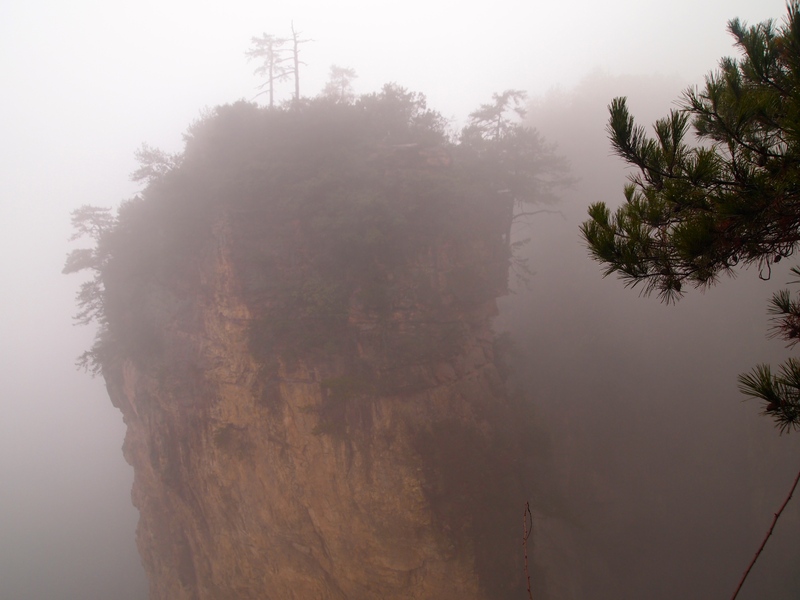 According to China Highlights: Zhangjiajie, Zhangjiajie sits in the west of Hunan Province, 330 kilometers from Changsha, the capital of the province, and over 1,000 kilometers from both Shanghai and Beijing. 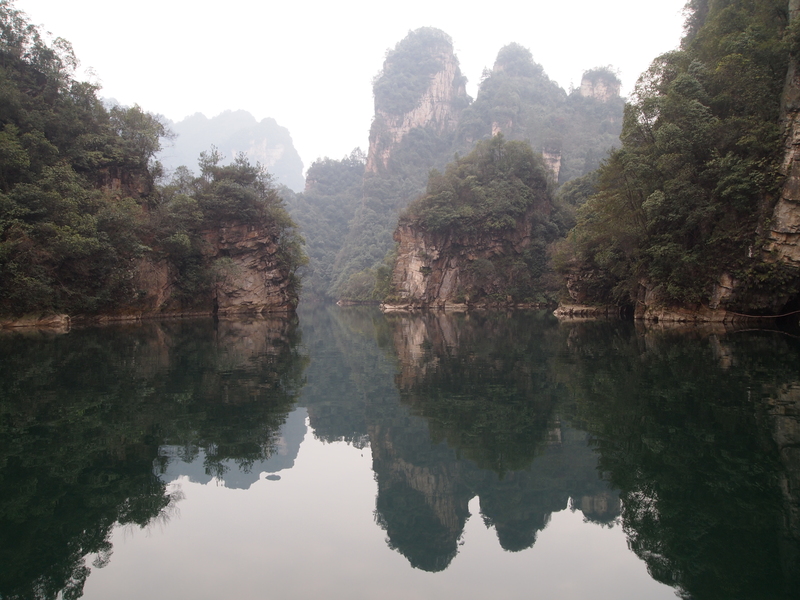 The park is famous for its precarious peaks, limpid streams, dense forests, and large karst caves. 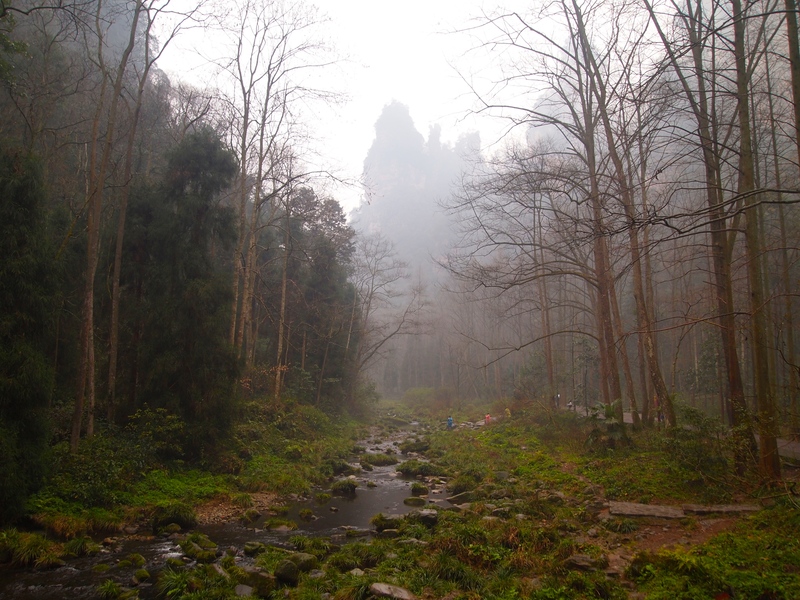 In 1982, Zhangjiajie National Forest Park became China’s first national forest park. 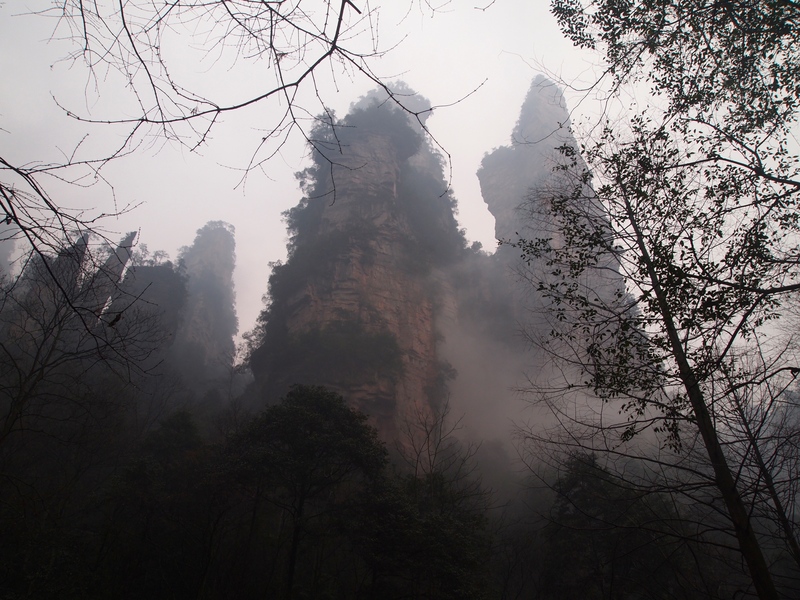 Zhangjiajie was the inspiration for James Cameron’s movie Avatar. 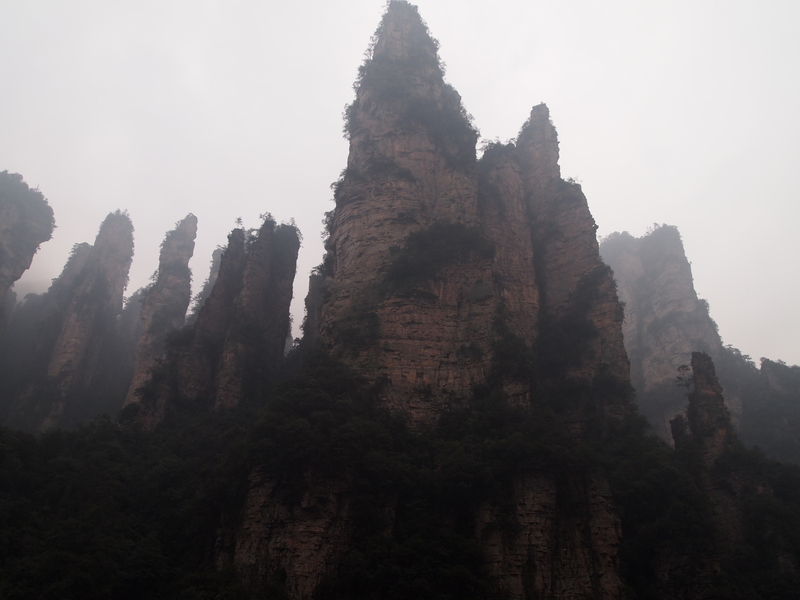 The park is known for its stone pillars that reach over 1km in height and resemble the ones seen in the movie; I haven’t seen the movie myself. 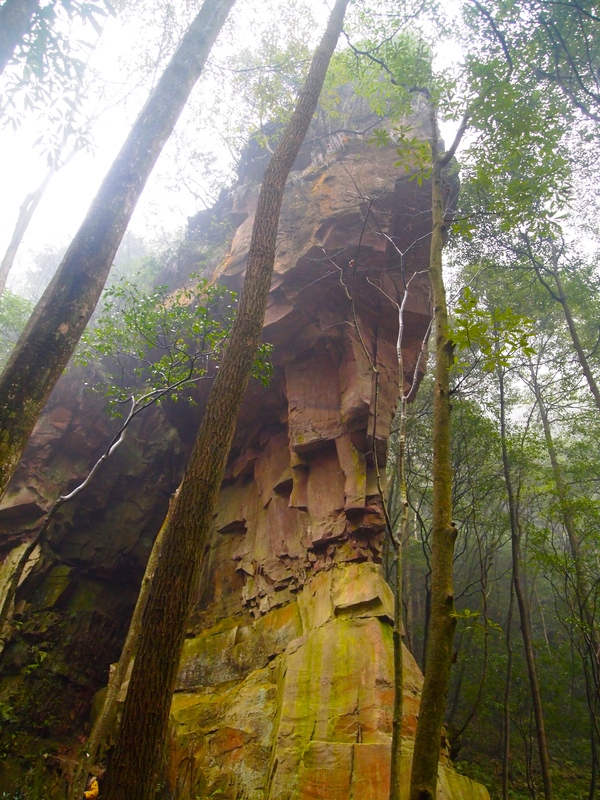 The area has approximately 3,000 tall quartzite sandstone pillars. 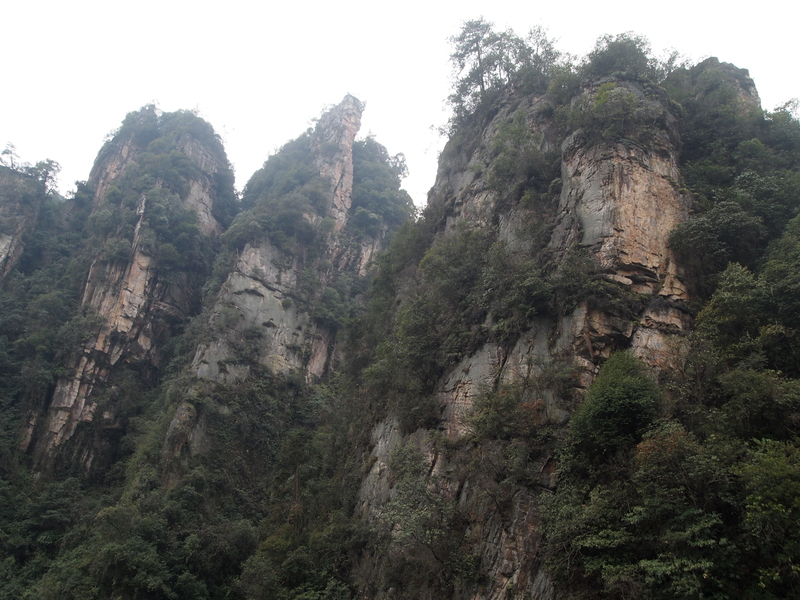 These are different from the karst formations in Guilin, which are limestone. 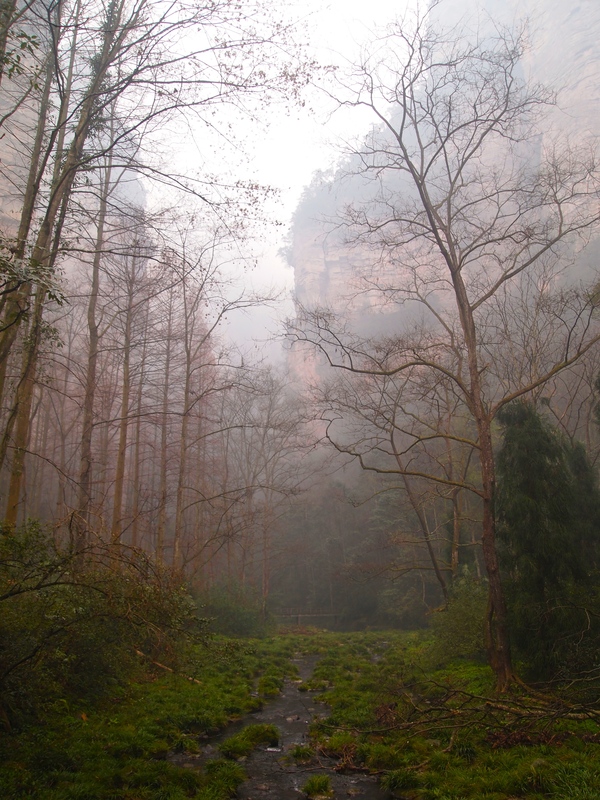 According to Wikipedia: Zhangjiajie National Forest Park: Although resembling karst terrain, this area is not underlain by limestones and is not the product of chemical dissolution, which is characteristic of limestone karst. They are the result of many years of physical, rather than chemical, erosion. Much of the weathering which forms these pillars are the result of expanding ice in the winter and the plants which grow on them. 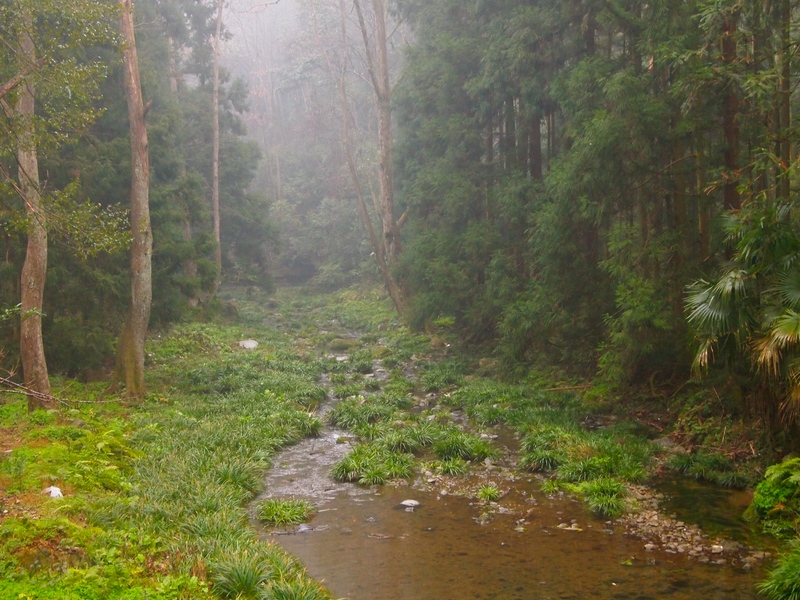 The weather is moist year round, and as a result, the foliage is very dense. The weathered material is carried away primarily by streams. 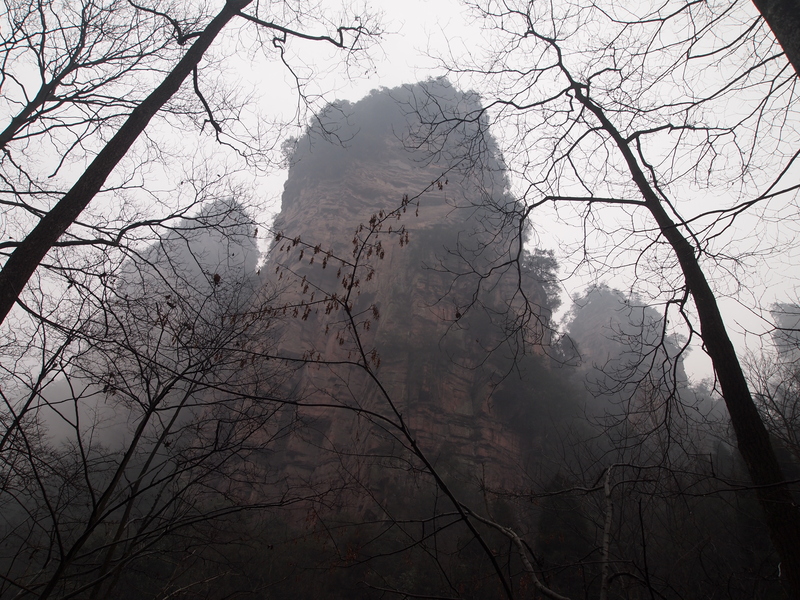 These formations are a distinct hallmark of Chinese landscape, and can be found in many ancient Chinese paintings. 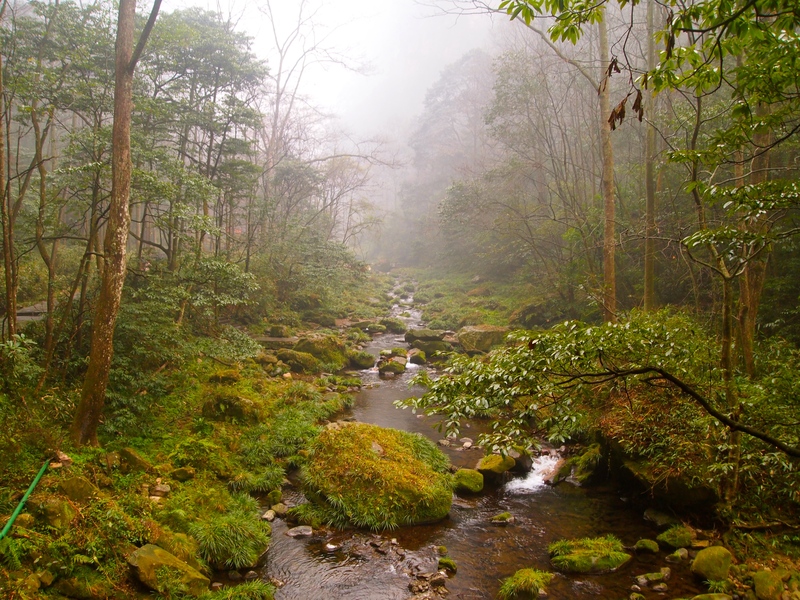 We are advised by Donald, an English-speaking Chinese manager at the Hotel Pullman, to take a 5 km walk today along Golden Whip Stream, since it will be raining all day. I’m interested in going to the higher elevations, but we’ll wait until tomorrow in hopes that the rain and fog will clear so we can enjoy the views. 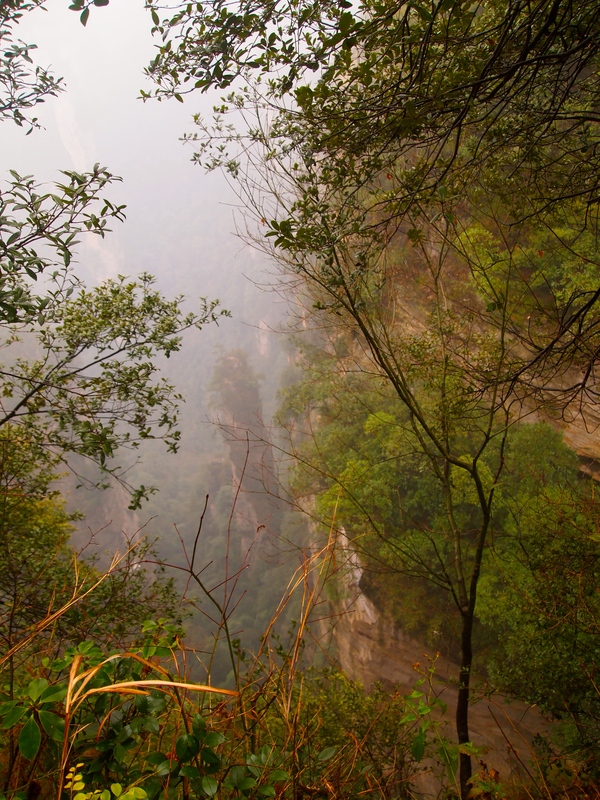 Golden Whip Stream is in Jinbianxi Canyon, a deep canyon surrounded by cliffs and peaks. A sign at the park says the distance from the peaks to the valley bottom is 350-500 meters and the width of the valley base is 30-80 meters. 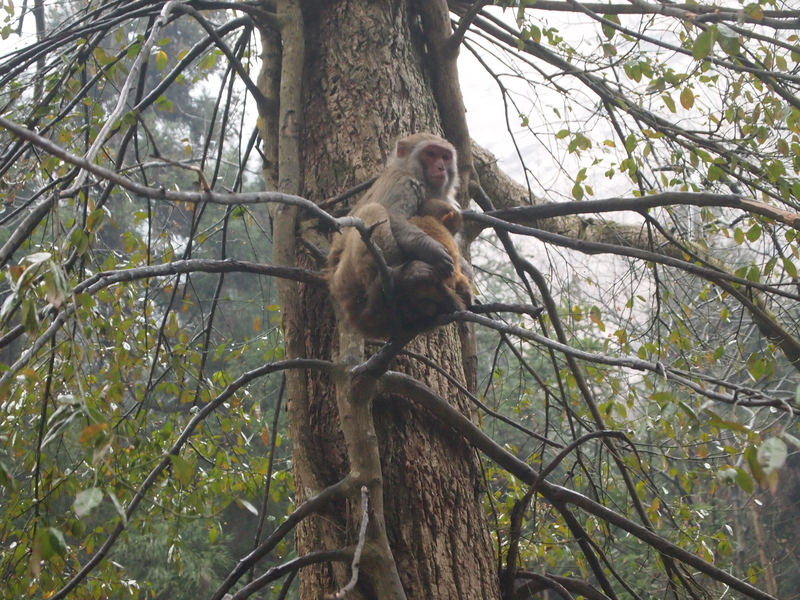 More monkeys are in the trees around us. This mother is holding her baby close. We can see some beautiful peaks along our walk, peaks with names such as Golden Whip Crag and Splitting Mountain to Save Mother, among others. 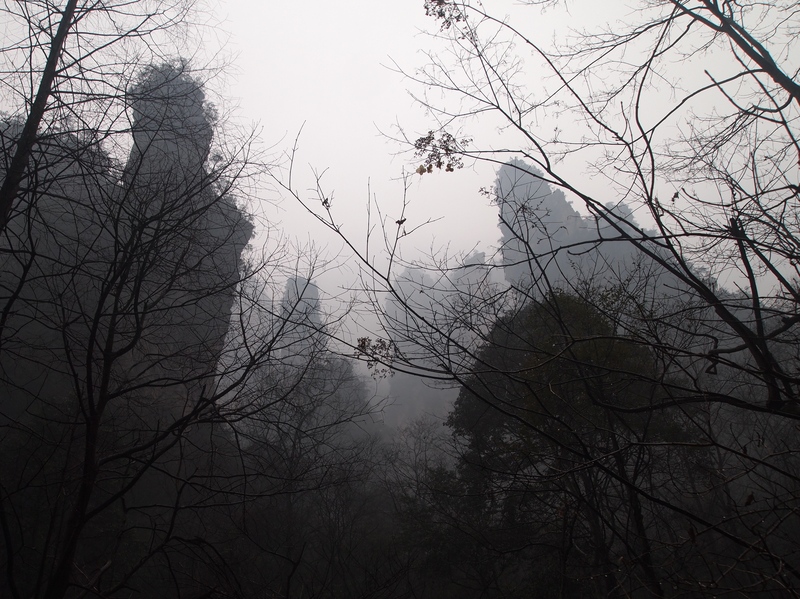 They’re enshrouded in fog. 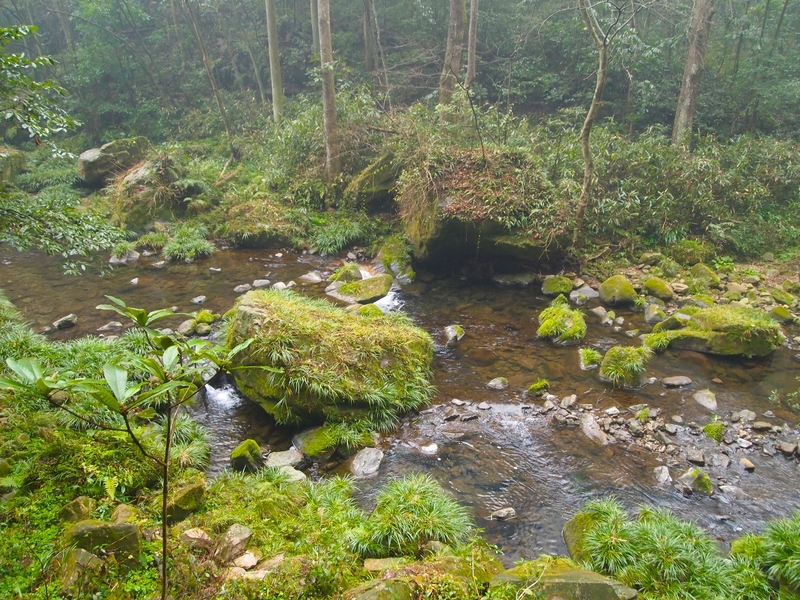 As we walk along the stream, it feels like my feet are getting colder and colder. They even feel like they’re wet, but how can they be? I have those plastic shoe covers on. I inspect my shoes and find that water has collected on the plastic shoe covers and is seeping into my shoes. They are soaked through and through. I take off the shoe covers, realizing too late that I would have been better off without them. My feet are soaked and will be for the rest of the day. Even with all the layers of clothes, I am shivering, and now with wet feet, I feel even colder. 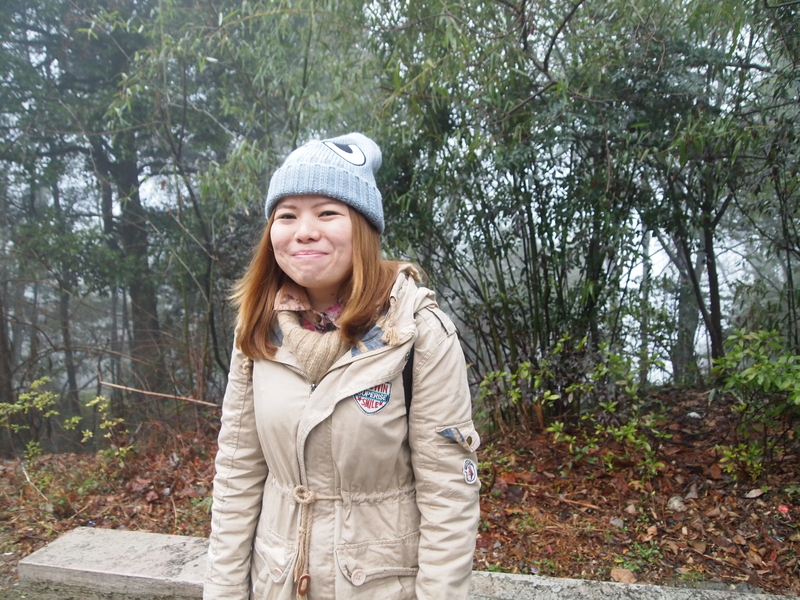 But of course, we’re here to enjoy the walk and we must complete the 5km long path. There’s no easy way out to return to the hotel to change my shoes as there are no cars or roads along this trail. Every once in a while we get a glimpse of color through the fog, and I foolishly hope that the fog will lift. It doesn’t. Some of the peaks have interesting names. This one is Splitting Mountain to Save Mother. I wonder what they look like on a sunny blue-sky day? How would you like to try to climb one of these? After all our walking, we’re getting quite hungry. 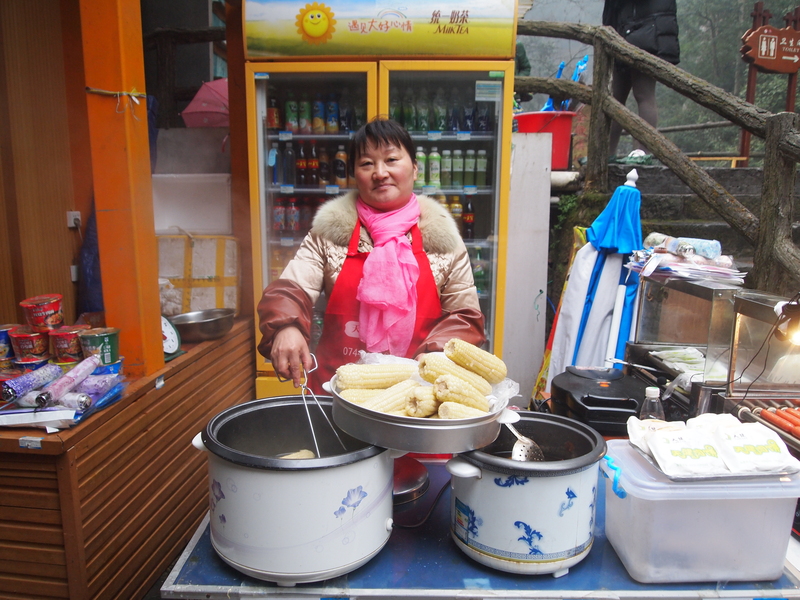 We come upon a little set of food stalls in the middle of nowhere and we stop for a snack of corn on the cob and boiled eggs. We continue on our walk through more of the valley. The views would all be amazing if they weren’t so obscured by fog. I love how the Chinese give such interesting names to mountains. 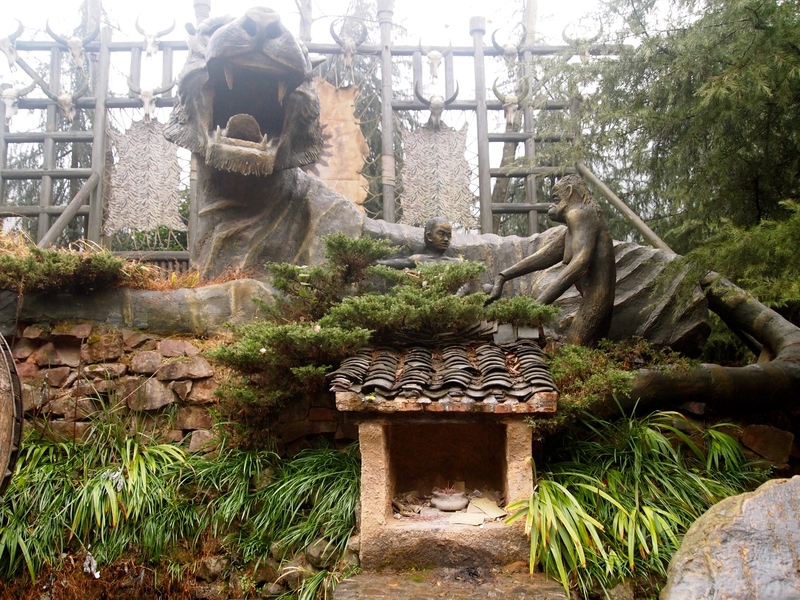 Along this trail, we see: Monkey Playing in the Chinese Yew Grove, Master and Apprentice Journey to the West, Pigsy Looking in the Mirror, Two Turtles Peeking at the Stream, Rabbit Watching Moon, Soldiers Gathering and Candle Peak. Luckily, it has stopped raining by now, but my feet are still wet and I’m shivery cold. The end of the trail deposits us at a parking lot in front of a little museum. 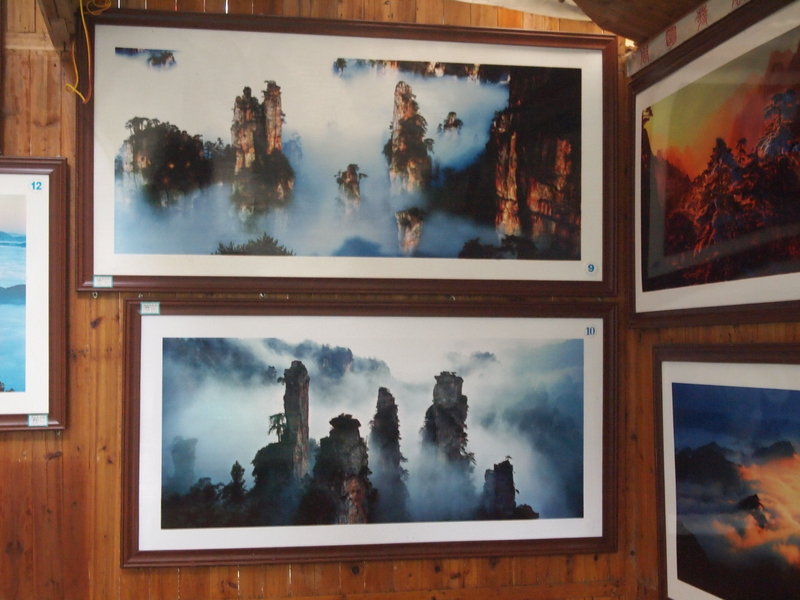 We wander about inside looking at the exhibits describing the karst formation at Zhangjiajie. We’re also hoping to get warm here, but no such luck; the building isn’t heated. We take a small bus to another part of the park where you can take a train for some more views. This is called the Long Gallery. 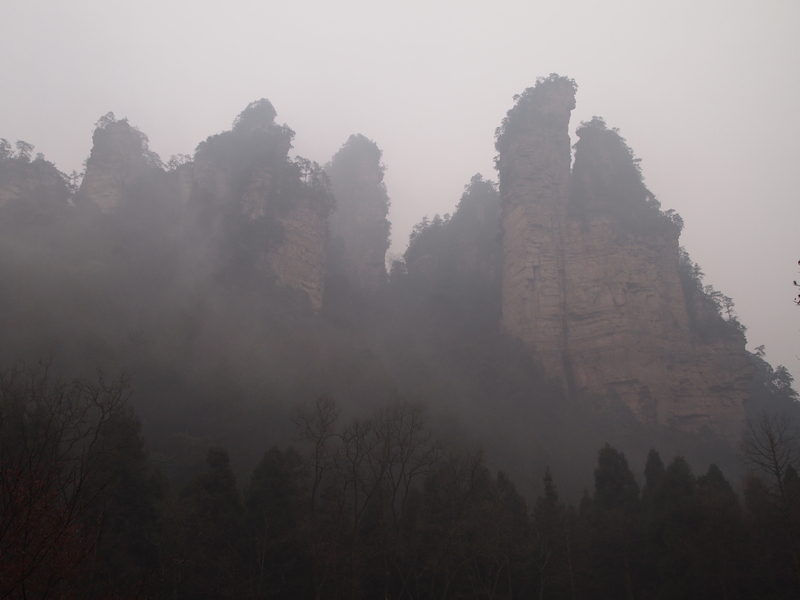 Some of the peaks which we can barely see here are called Her Collecting Old Man, Three-Sisters Peaks, and The God of Longevity Welcoming Guests. Our views are even more hazy on this train ride. When we get back to our hotel, I’m happy to take off my wet shoes and to take a long hot soak in that bathtub, drinking a glass of wine in the steaming water. I can open the slatted doors and chat with Mike in the room. It’s lovely. 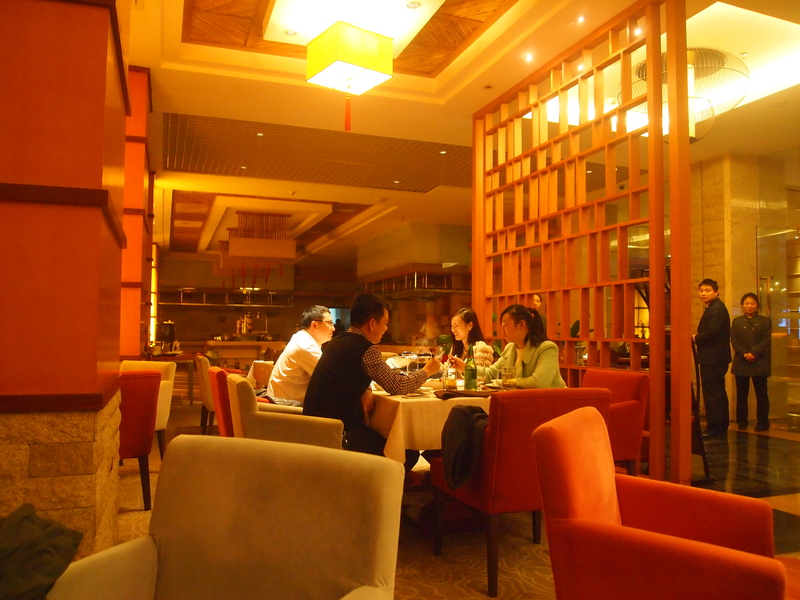 Then we treat ourselves to a nice dinner in the hotel restaurant. 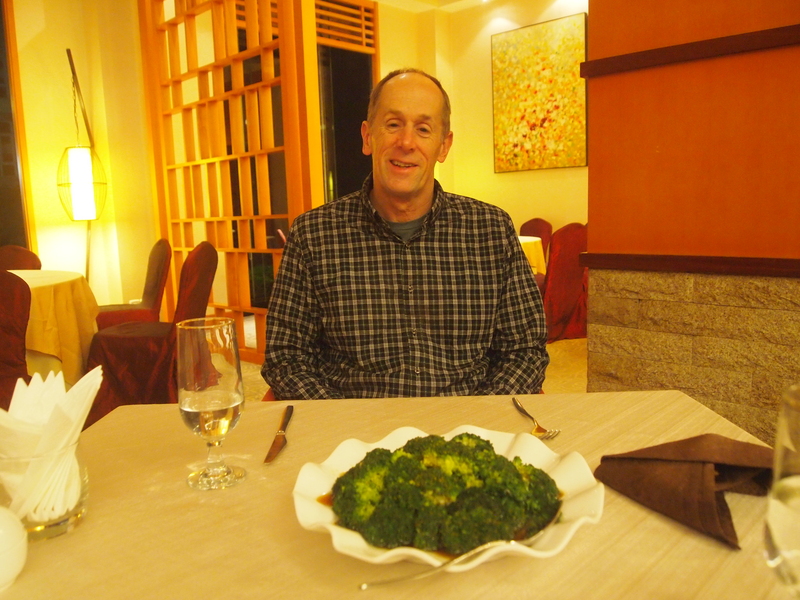 Mike orders steamed broccoli and gets a huge plate of it. Me at dinner. I order a plate of spring rolls. 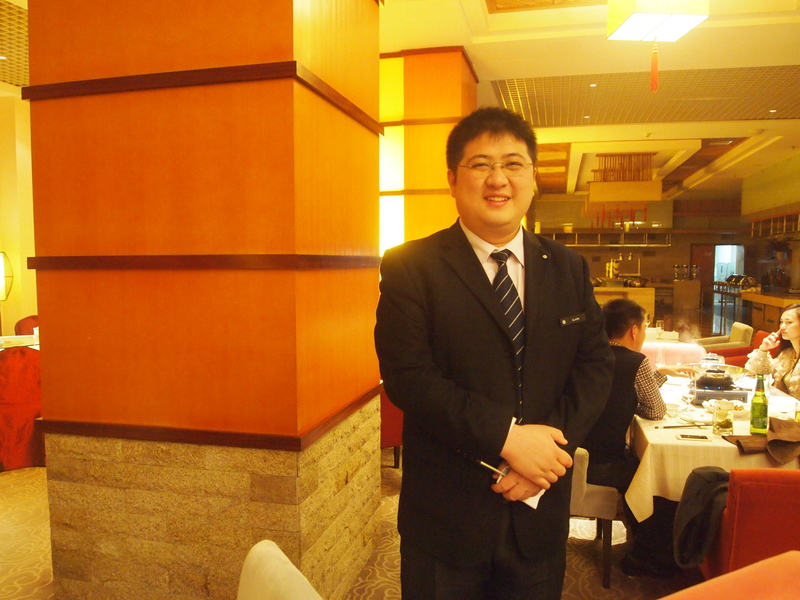 Donald, an English-speaking manager at the Hotel Pullman, has been super friendly and helpful to us. 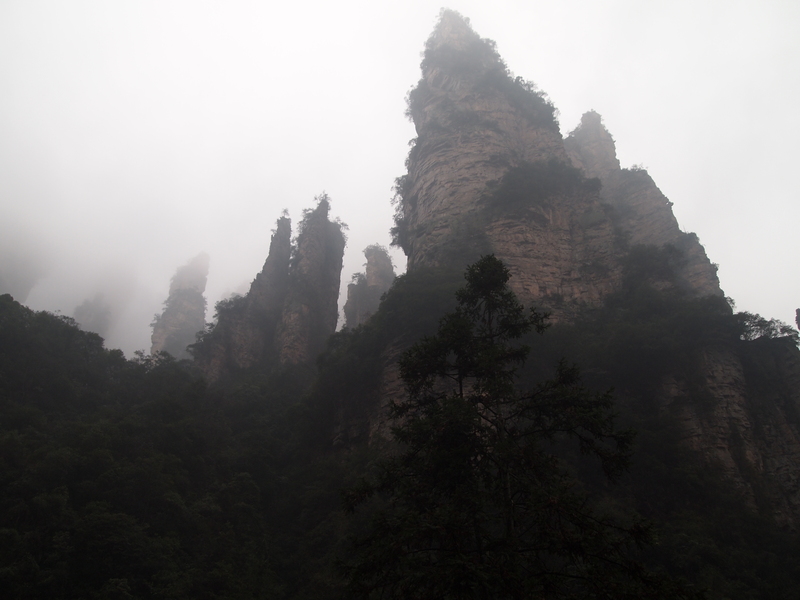 As we only have one more day in Zhangjiajie, we ask him if we can hire a guide for the day to take us to the higher elevations. He arranges the guide for us, even though we all know that another rainy and foggy day is forecast for tomorrow and our chances of seeing anything are slim to none. 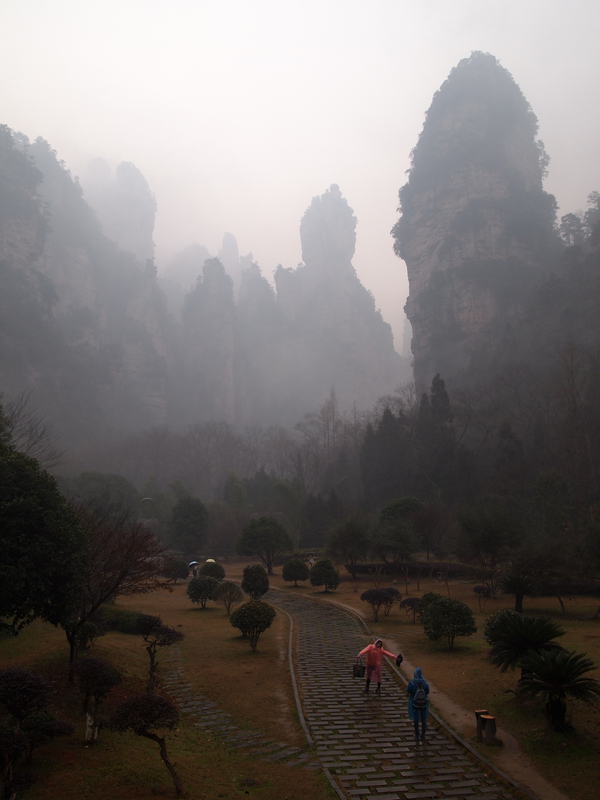 If you want to see some pictures of how this park looks in beautiful weather, I suggest you drop by to visit China Nomads: The Karst Peaks of Zhangjiajie. Friday, January 23: Everyone should know by now my aversion to buses, especially those of the Chinese variety. Usually I won’t submit to one over two hours long, opting for a train or a plane if possible. Sometimes I’ll even pay a taxi an exorbitant sum just to avoid them. 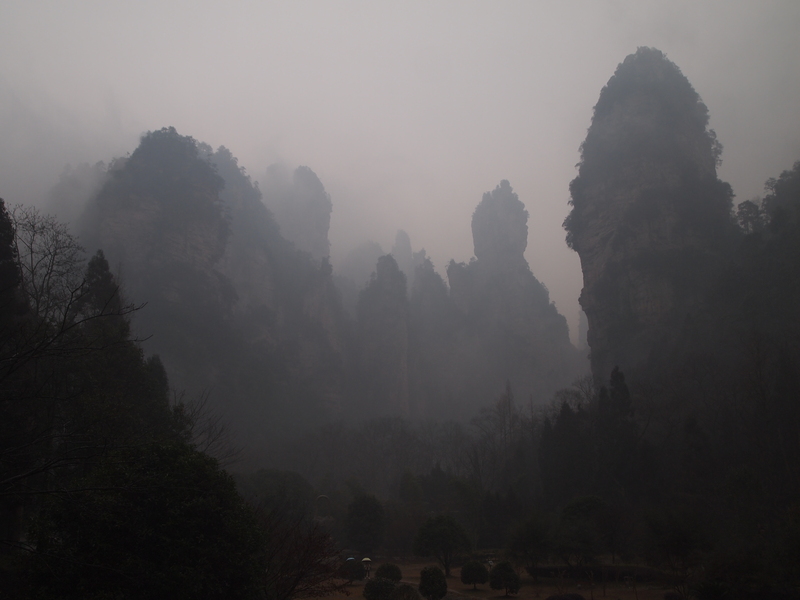 In this case, we need to get back to Jishou this morning for a 10:48 train to Zhangjiajie, only about an hour’s bus ride, but I still don’t want to take the bus. We decide we’ll pay for a taxi, directly from our hotel to Jishou. I can’t remember the amount we pay, but whatever it is, it’s worth it. Sometimes I don’t care about money and I will opt for comfort and convenience over all else. We arrive at the Jishou train station and wait with the usual hordes to board. This is not a fast train, but an older one that makes numerous stops along the way. I love the new comfortable bullet trains, but I couldn’t find one for this trip. 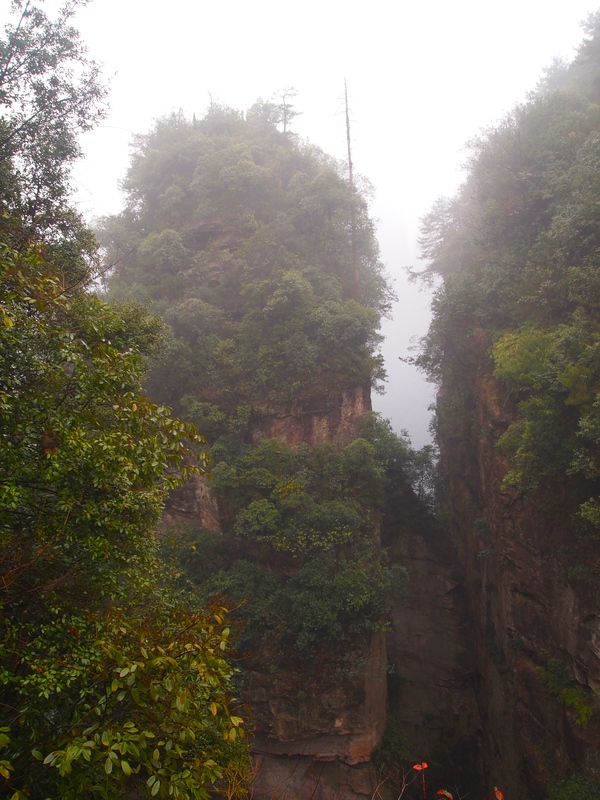 This one is due to arrive in Zhangjiajie at 12:33, but as it’s late to arrive in Jishou, it’s also late to arrive at our destination. The seats on this one are a little cramped, with three seats facing another three seats. These are called the hard seats and were the only option on this train. The bullet trains have only two soft and larger comfortable seats on them, and they all face forward. 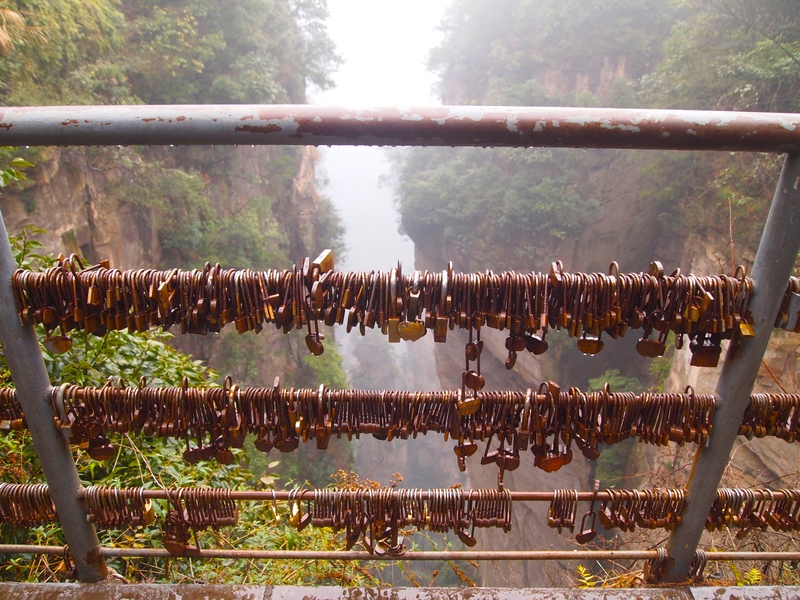 It seems every college student in Hunan province is on this one. They all have the same break from school that I do. Somehow, Angela, my student helper who bought these tickets for me, wasn’t able to get seats for Mike and I together. However, he’s sitting behind me, back to back. Here’s a view of our whole car. Notice how everyone’s on their mobile phones. 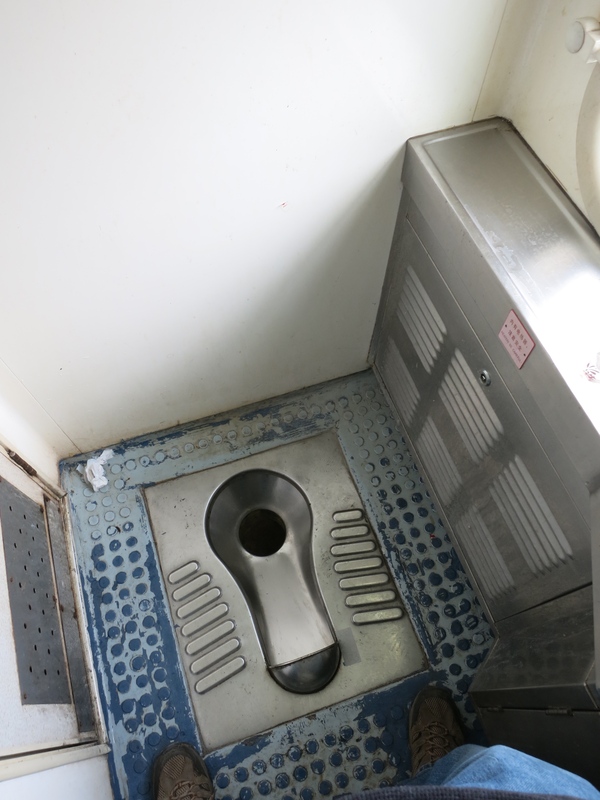 And of course, we must have at least one picture of a Chinese train toilet. 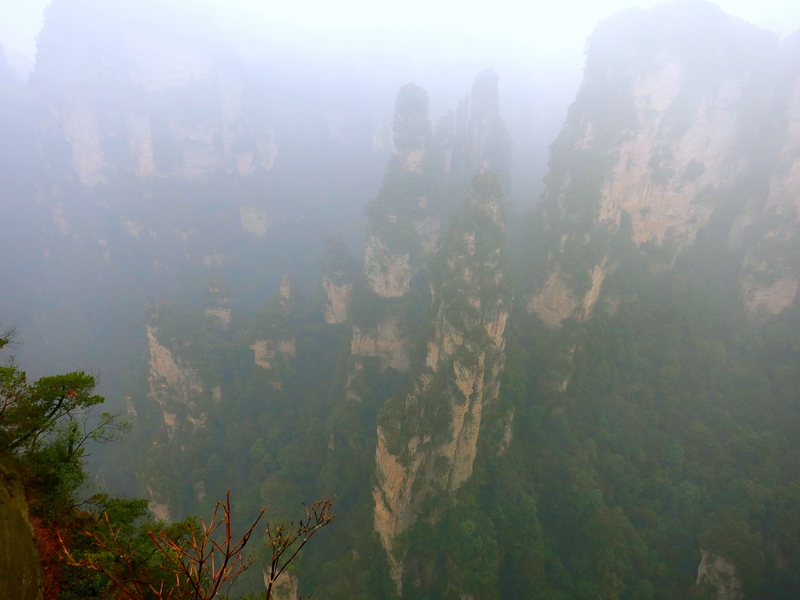 Zhangjiajie must be a big destination because the train station here is sprawling and relatively new. New buildings in China seem to always be large to accommodate the large crowds of people. 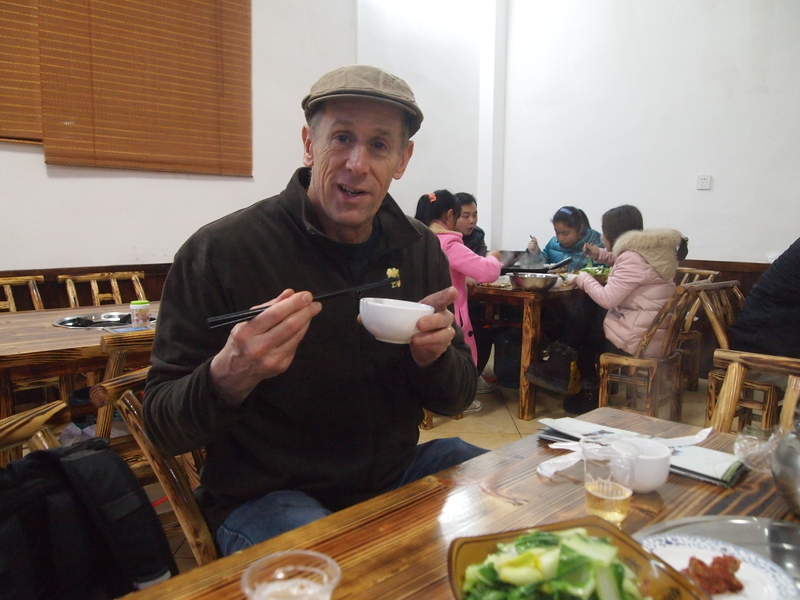 Mike was worried about heating in our hotels, as I told him that I’ve heard there is no heat generally in Chinese buildings south of the Yangtze River in China. 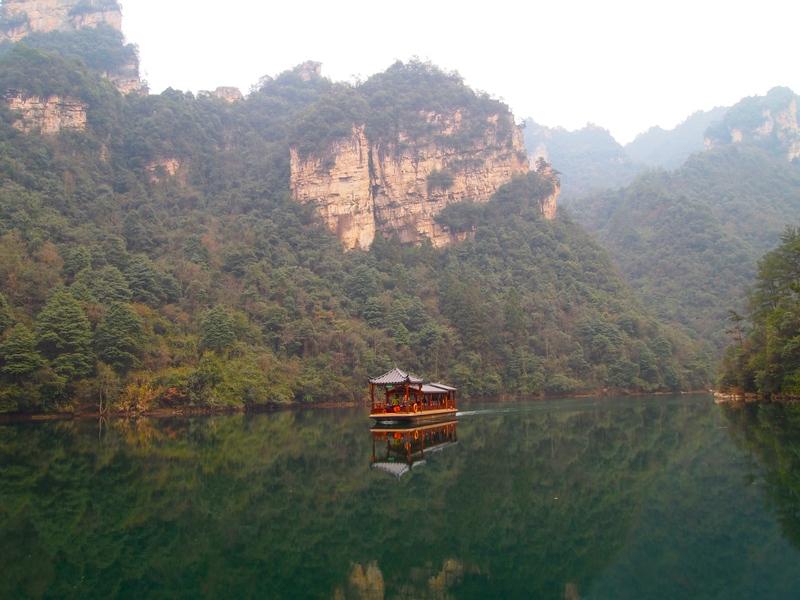 He asked me to book us a nice hotel in Zhangjiajie, so I booked the Hotel Pullman Zhangjiajie, which is a real treat. It turns out we don’t encounter many heating problems in our hotels generally, but this one is exceptionally toasty. Most of the older buildings have wall unit air-conditioners that double as heaters, but they’re not that warm unless you happen to be right under them. 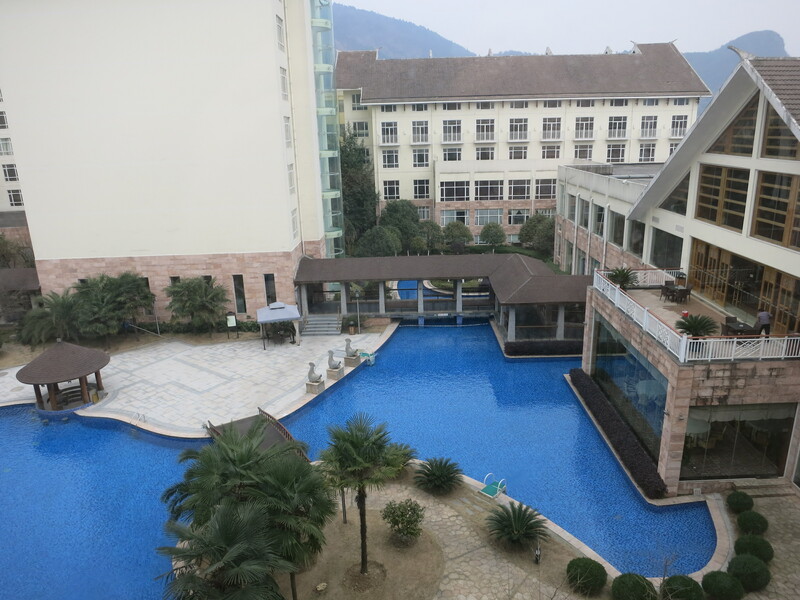 We have a great view of the pool below, but of course it is too cold to enjoy a pool. The best thing about the room is the bathtub. I love a long hot soak, and am normally a daily bath taker when I’m at home in Virginia. Sadly, I’ve had to give up my baths for the most part when I’ve lived abroad. I also like that the folding doors open up to the rest of the room so you can have a bath with a view! 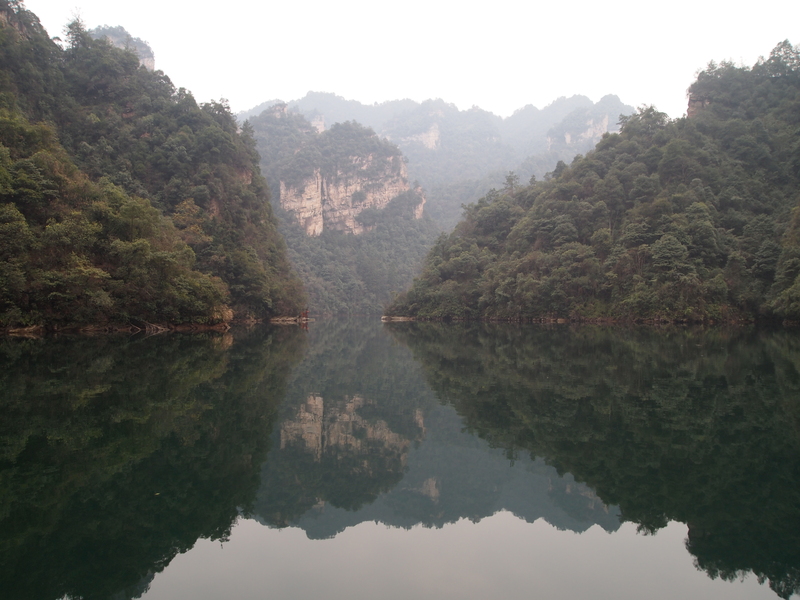 Since it’s late afternoon by the time we settle in and eat some outrageously expensive pasta for lunch at the hotel, we decide to visit Baofeng Lake Scenic Area, which will not be so time-consuming as the Wulingyuan Scenic Reserve (widely known as Zhangjiajie). At the entrance, a sign states that senior citizens get a discount, and so I give the woman the reduced price for Mike, insisting that he’s a senior citizen. She refuses to accept the reduced fee and keeps waving her hand back and forth emphatically: “NO!” After going around and around about this, someone else comes to the rescue in our stand-off and states in broken English that this reduction is only for Chinese citizens. 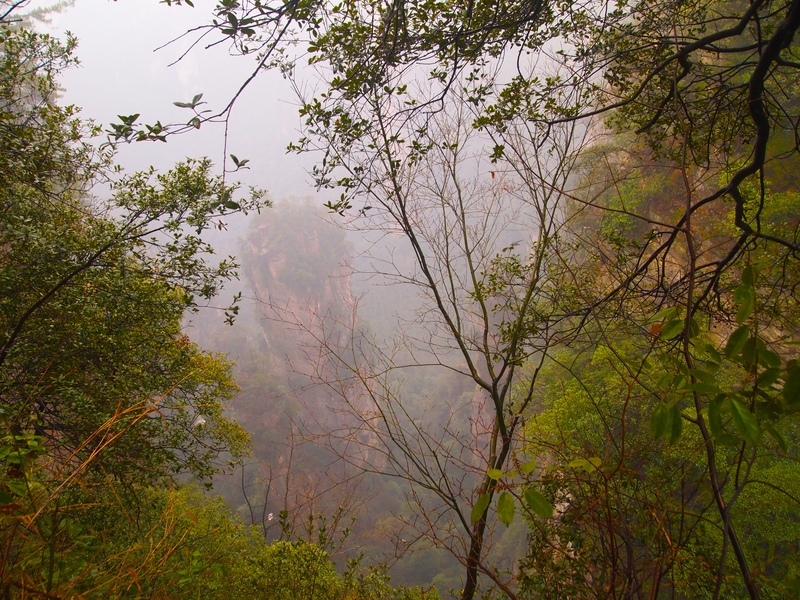 When we enter the Scenic Area, there is a pedestrian-only road, and we walk uphill a long way until we see steps climbing up and up into the clouds. 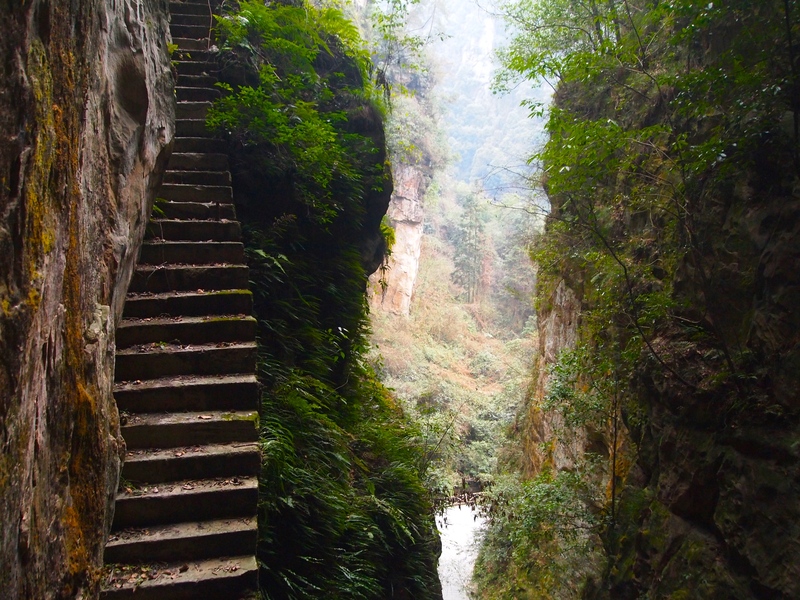 It’s a very long walk up, with many stops to catch our breath along the way. 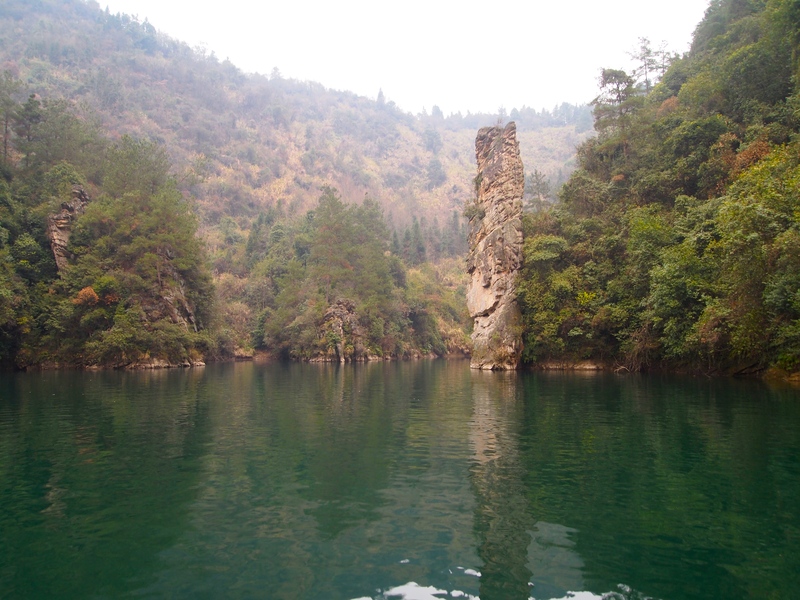 According to ChinaTravel.com: Baofeng Lake: Baofeng Lake and the area immediately surrounding it offer pristinely beautiful natural scenery. Being located high up in the mountains, the lake catches some of the first and purest runoff water from the mountain peaks. Its height also guarantees an air freshness not found around lakes at lower altitudes. 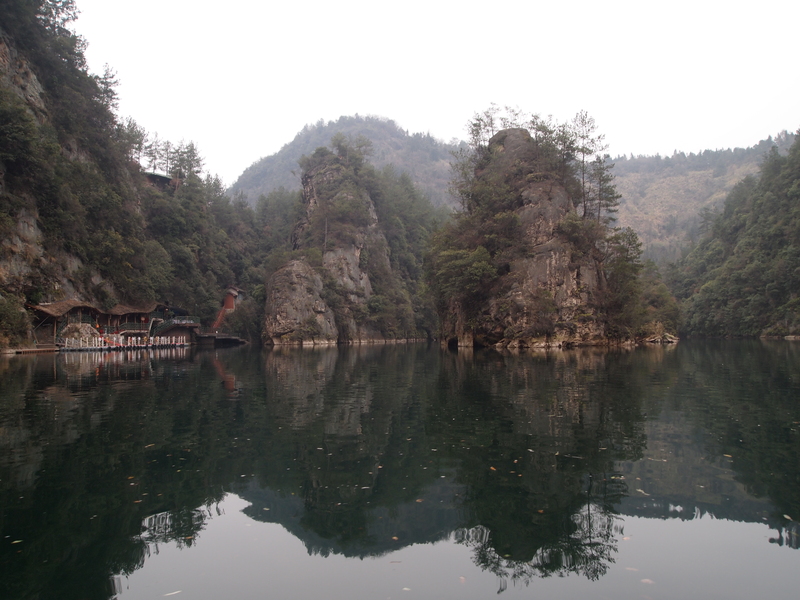 Baofeng Lake is bordered by lush green trees and shrub-clad stone peaks of various shapes that enclose the lake and give it a fairytale-like atmosphere. 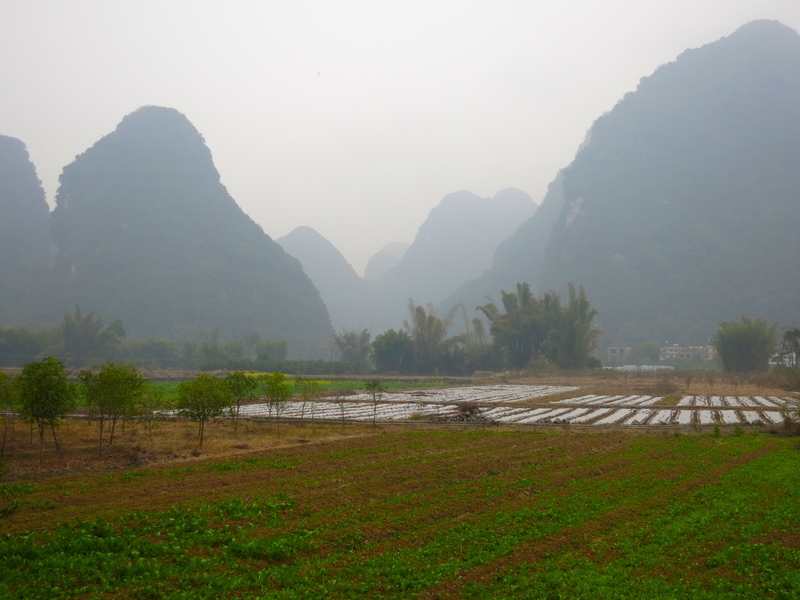 Indeed, Baofeng Lake is a reservoir, with a dam enclosing its waters, not for the purpose of power generation, but for the purpose of crop irrigation. 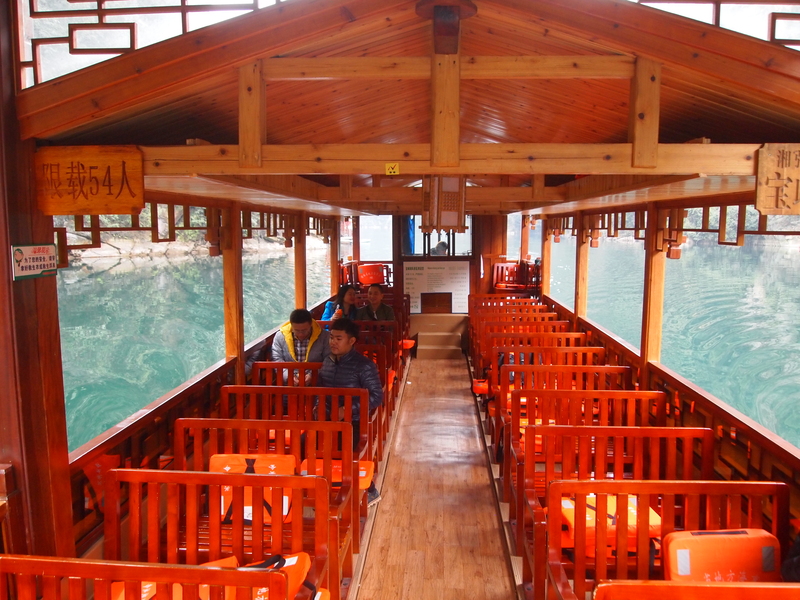 There’s a boat ride around the 2-kilometer lake, but we have to wait a bit for enough people to get on the boat. Apparently, it’s the last one of the day. 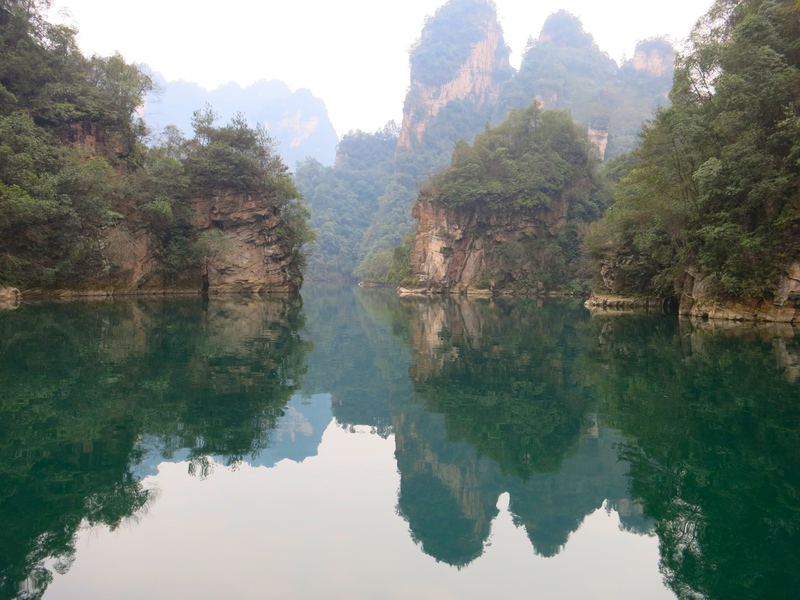 So we wander around and check out the scenery, with the karst reflections on the water’s surface. 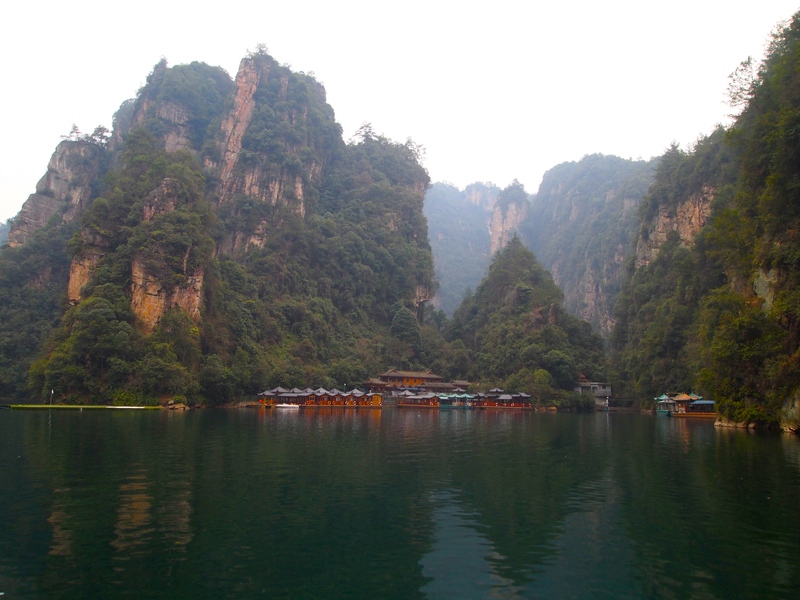 A Chinese woman, who is at the lake with her boyfriend, speaks excellent English and talks to us for some time about her business of exporting mostly to Middle Eastern countries. She also asks us a lot of questions about ourselves. We ride on the same boat together. The boat ride is actually quite short. It’s overcast today, but tomorrow rain and fog are forecast, so I guess we should be happy with the non-leaking clouds. 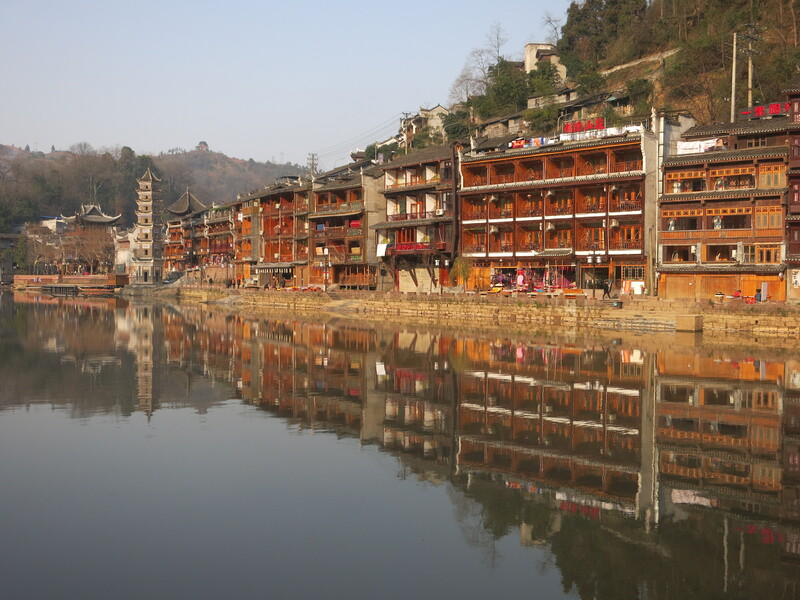 It’s a little disappointing after our sunny but cold days in Fenghuang. As we approach this little cottage, a woman in ethnic costume walks out on the porch and serenades us with a lovely melodic song. All onboard give her a round of applause and we continue on our little boat ride. 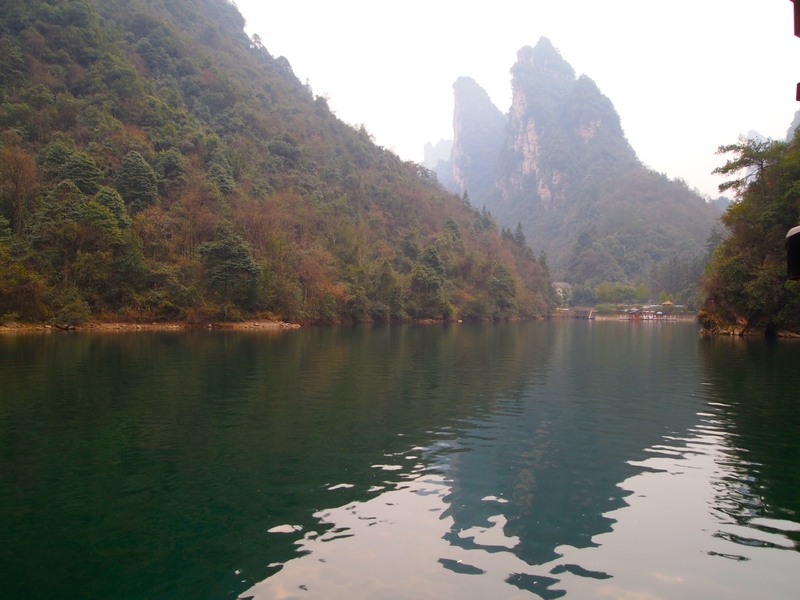 The average depth of the lake is 72 meters, and as I stand near the edge of the boat to take pictures, the Chinese woman asks me if I’m not afraid to stand so close to the edge of the boat when the water is so deep. I say to her that it doesn’t really matter about the depth of the water because I can swim. Whether it’s 10 meters or 100 meters makes no difference. I guess I don’t understand these kinds of fears. 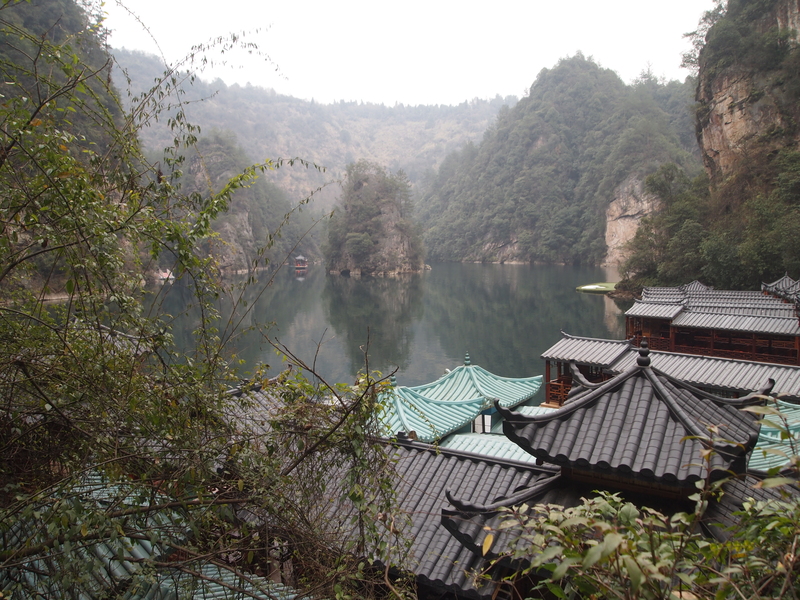 After our boat ride, we are deposited on another shore, and we walk down many flights of steps to the valley floor. Here’s our view from above as we walk down. We see this old set of steps that is no longer used. 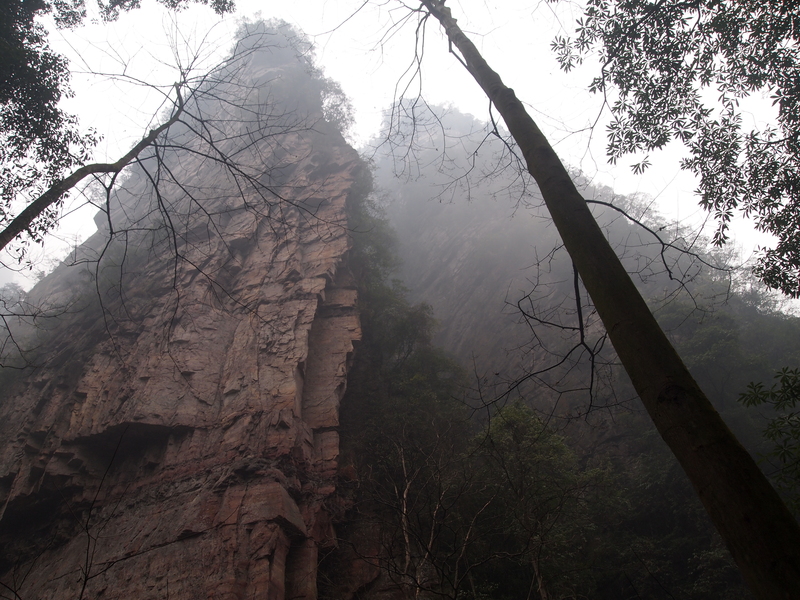 It looks a little scary and precipitous! 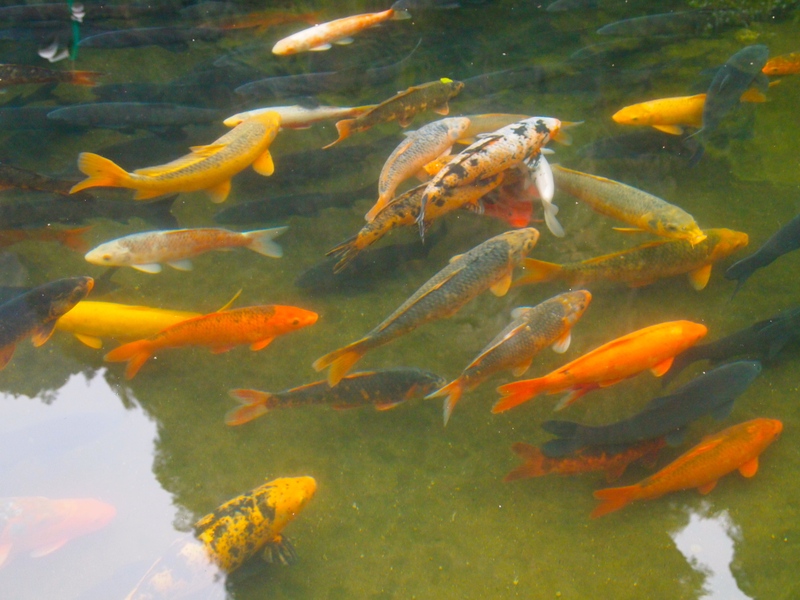 At the bottom, we find a koi pond. And a hanging bridge, which we walk over. 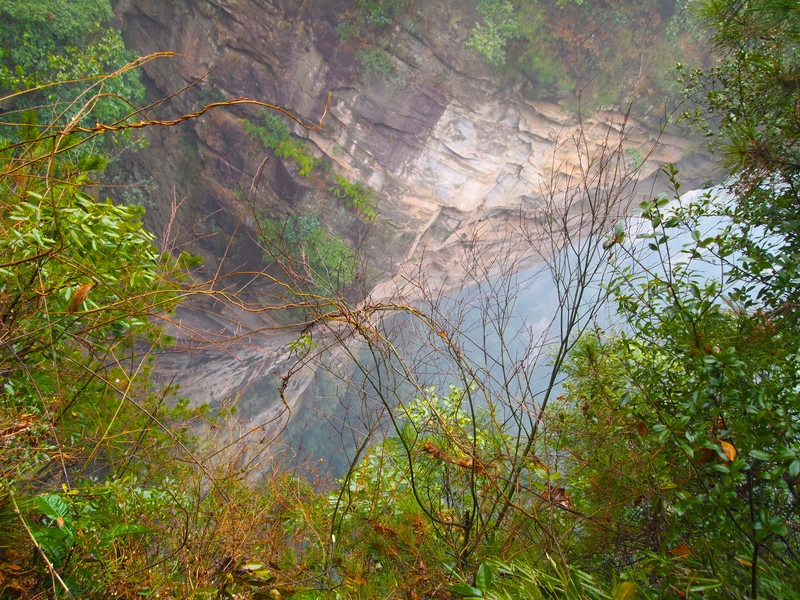 It is more scenic from below. 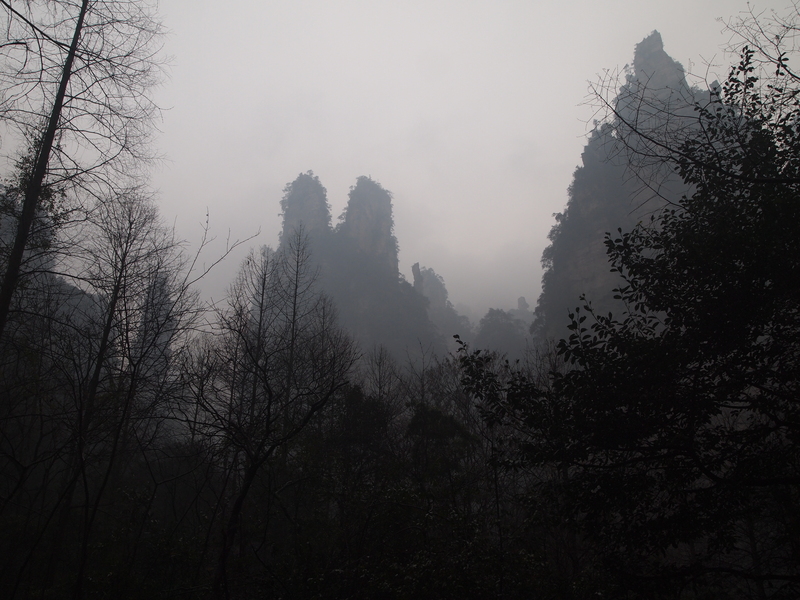 From the valley floor, we can see the karsts towering above us. 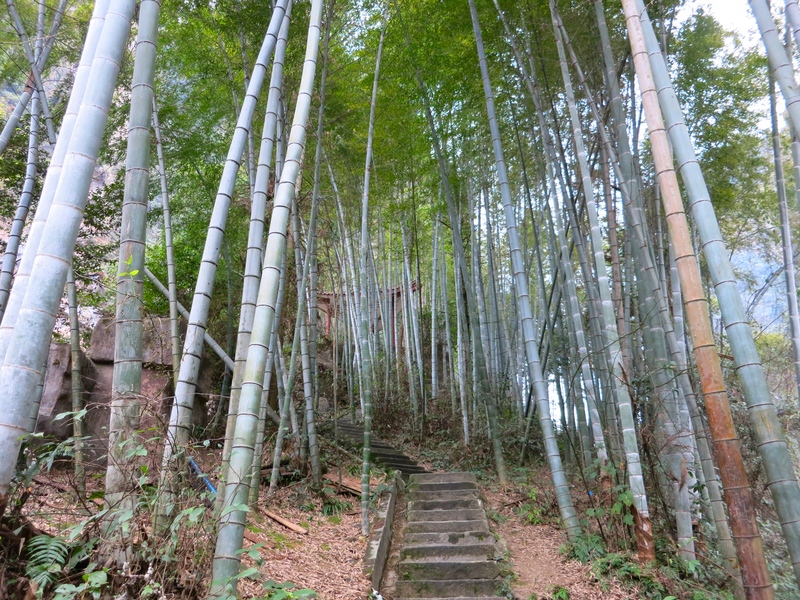 As well as a grove of bamboo. 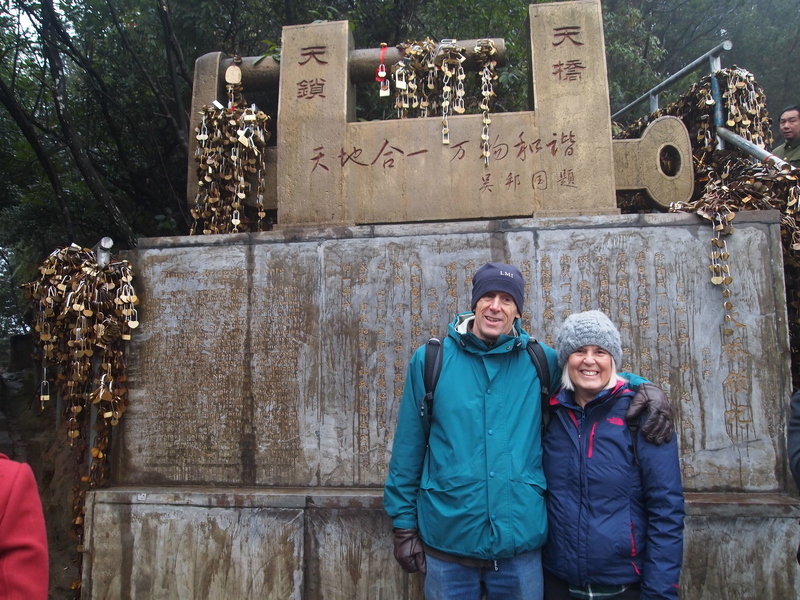 We decide we will walk back to town, which turns out to be quite a long haul, especially after all the stair climbing and descending we did to get to Baofeng Hu. 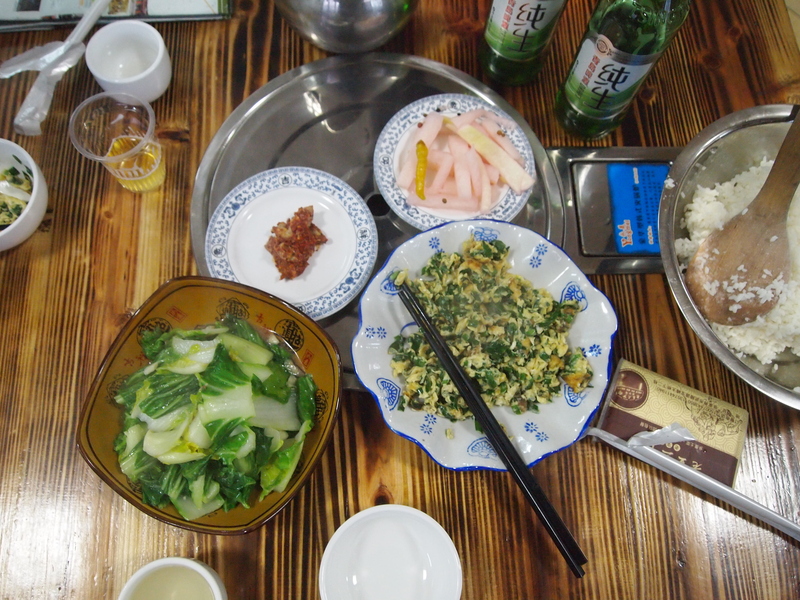 We find a restaurant, where I use my WayGo app to read the all-Chinese menu and we order a meal of bok choy, eggs with scallions, rice and pickled radishes, accompanied by two tall beers. As most people know already, I don’t have many choices in Chinese restaurants as the meat is all full of gristle, fat and bones. These make me gag. We drop by a convenience store to buy some water, orange juice and a box of some of my favorite chocolate mousse cake snacks. We’re exhausted from our day of travel and our long uphill and downhill hike, so I take a long hot bath and we conk out early. The forecast for tomorrow is still for rain and fog, but I keep foolishly hoping it will change just in time for us to explore the reserve.